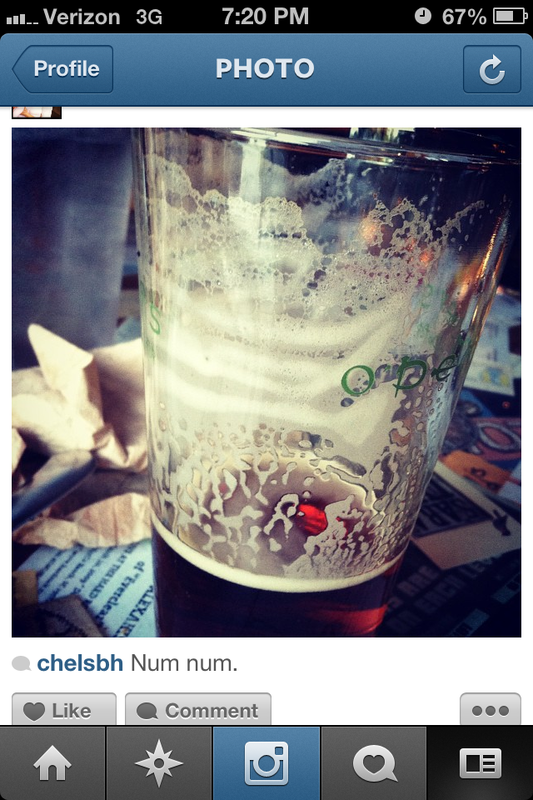 Instagram has proven to be my favorite phone app again and again. I have taken quite a few photos with Instagram only to say, “I should make that into an artwork.” I finally did just that. I took an Instagram photo from Sticks and Stones and turned it into a watercolor. See below. 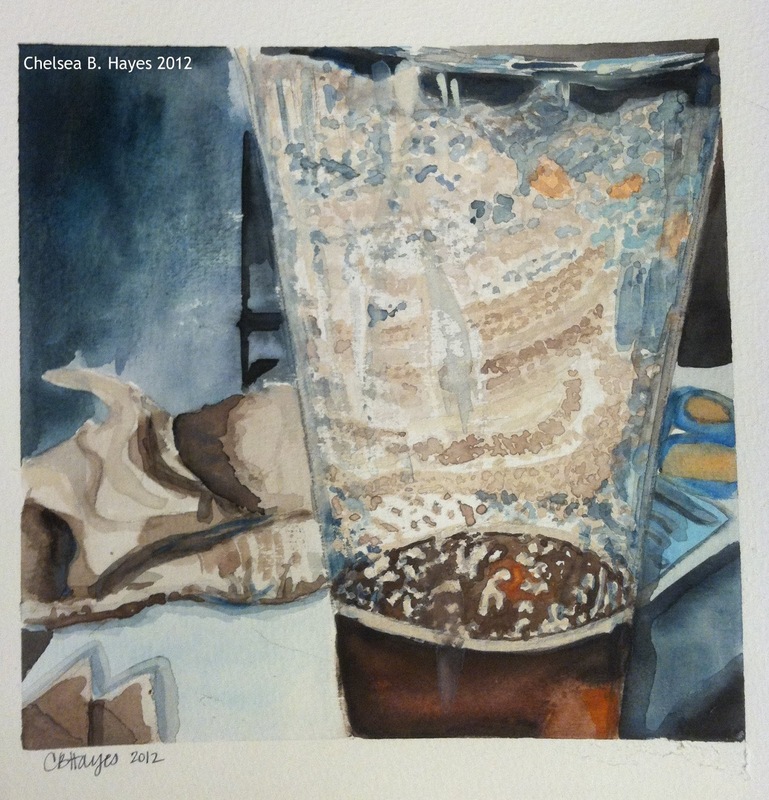 Beer Lace, watercolor on paper, 2012. Here is the original Instagram. 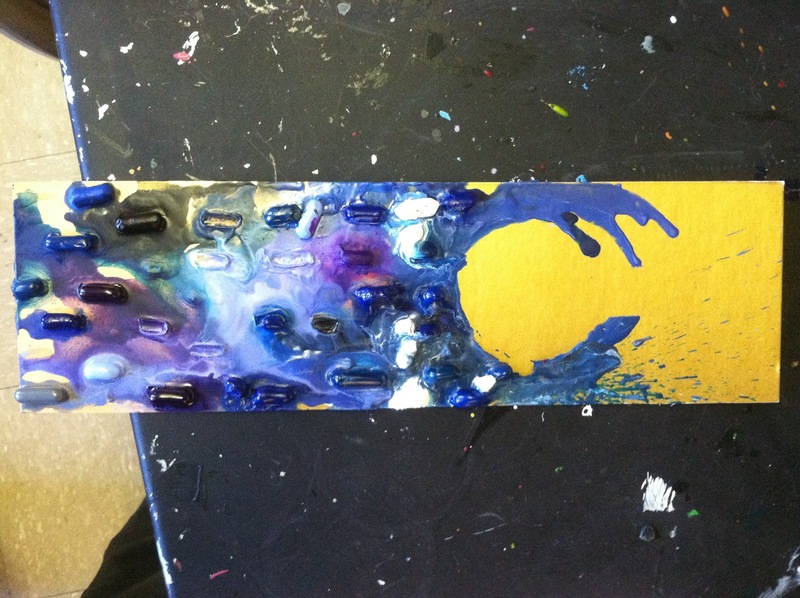 This blog was originally started to document my art making processes. It was a way to keep myself working and producing, and then Greta came along. I soon found the only creating I was doing was in the kitchen, since we all have to eat. While I love cooking and baking, I need to make art. So, I am trying to get back to the beginning of all of this and make more art. I know now I need to carve this time out during the week. There will still be recipes on here, but hopefully better balanced with art. Enjoy. Untitled, mixed media on mat board, 2012. This is a lesson that came about from Pinterest. I needed a short filler lesson for between major units and this one was a smashing success. 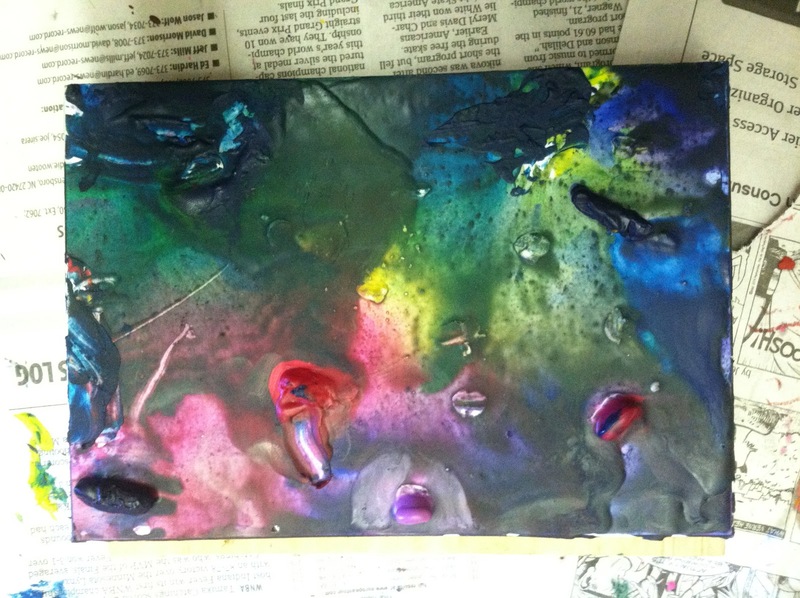 Sometimes I think I come across as a staunch neat freak to these kids because they were so excited that I was encouraging them to melt crayons instead of color with them! 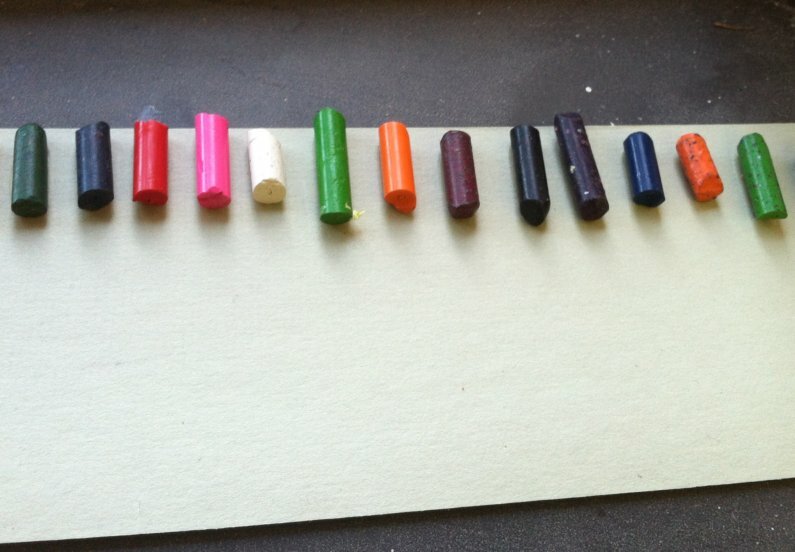 This is a great use for all those little crayon nubs that just cause frustration during drawing units. 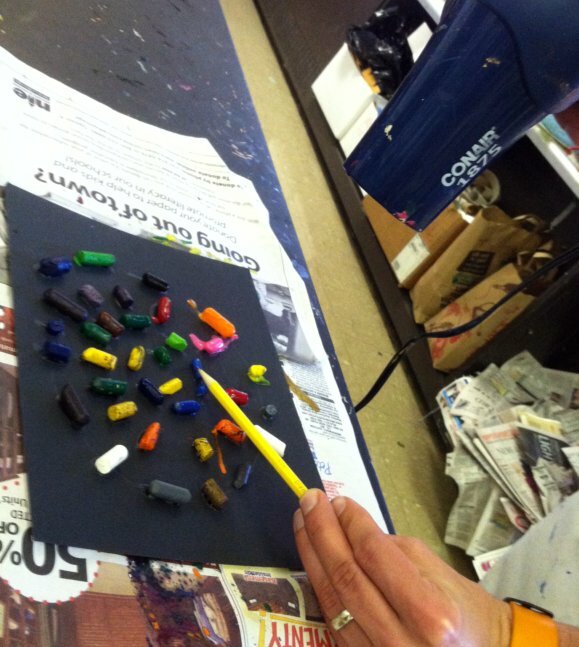 Step 1: Glue crayon pieces onto a board with school glue. Peeled crayons will melt faster, if you leave the wrapper on, you will have a wrapper glued in place, but the wax will still melt away. I had pieces of mat board cut in advance for them to choose from. 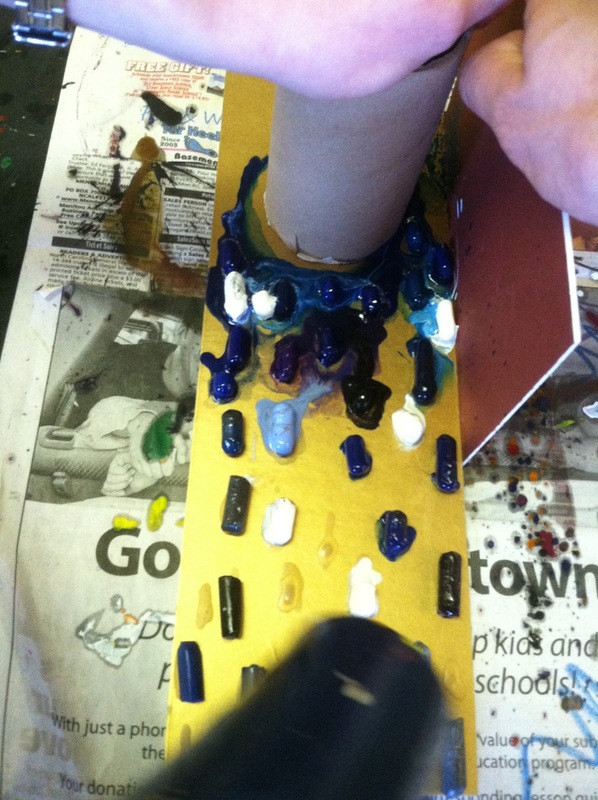 Consider designs or using objects to block and direct the melted wax. Step 2 : If using blocking objects, tape them in place. 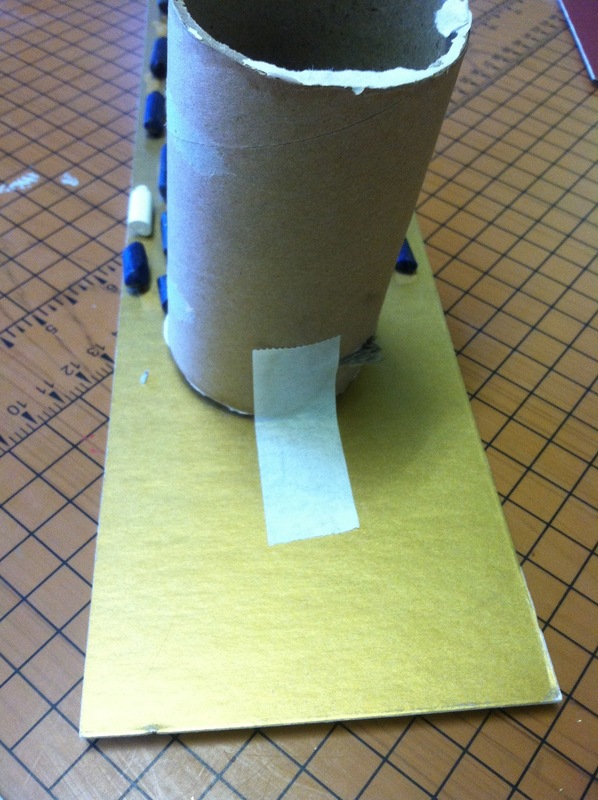 I used a cardboard tube held in place with masking tape. Step 3: Place on newspaper, and preferably inside of a box. The box will help catch the hot molten wax that will spray you and will burn. 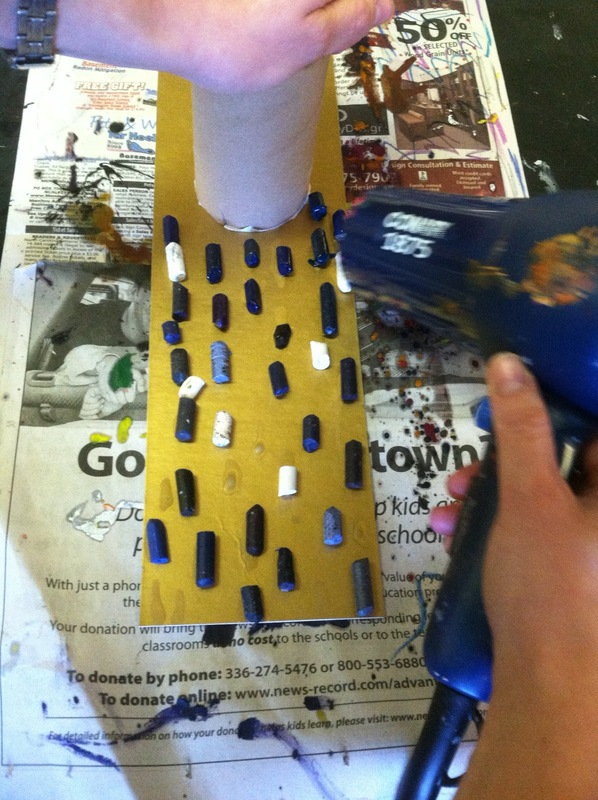 Step 4: Turn hair dryer on to high heat and point at crayons. Hold 6 inches or so away form crayon. Point the hair dryer in the direction in which you wish for the wax to flow. 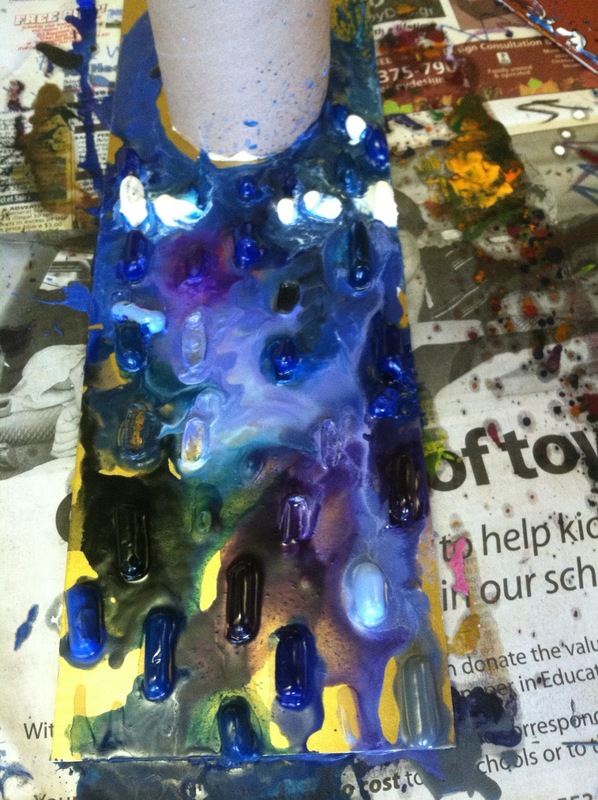 Within a few minutes you should see the crayons start to soften and melt. 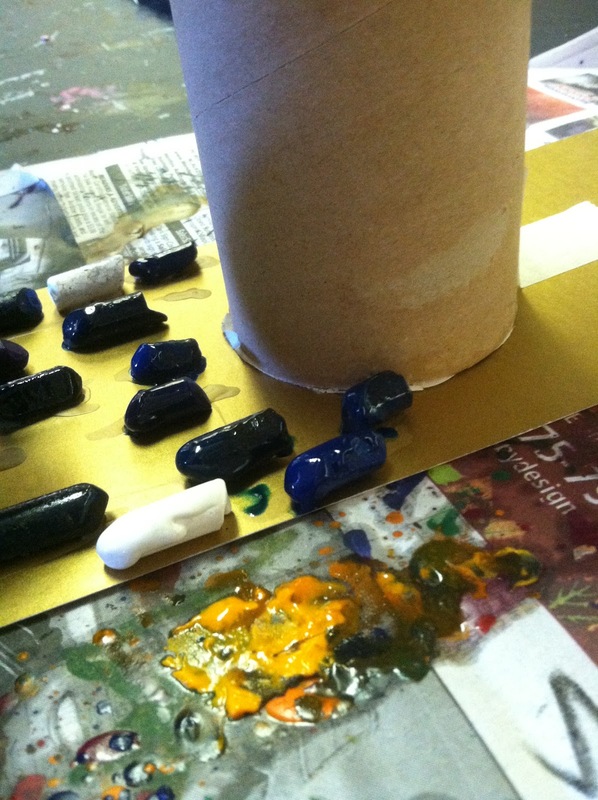 You can also use pieces of cardboard to block wax and direct the flow. If you have a helper, be careful of their hands as well. Once the wax starts to flow, direct it with the hair dryer. If crayons begin to come off, use a pencil or popsicle stick to hold them in place or move. If your hair dryer has a cold air setting, use that to set the wax more quickly. Step 5: Allow artwork to cool completely before moving. Remove blocking objects carefully so as not to remove wax as well. 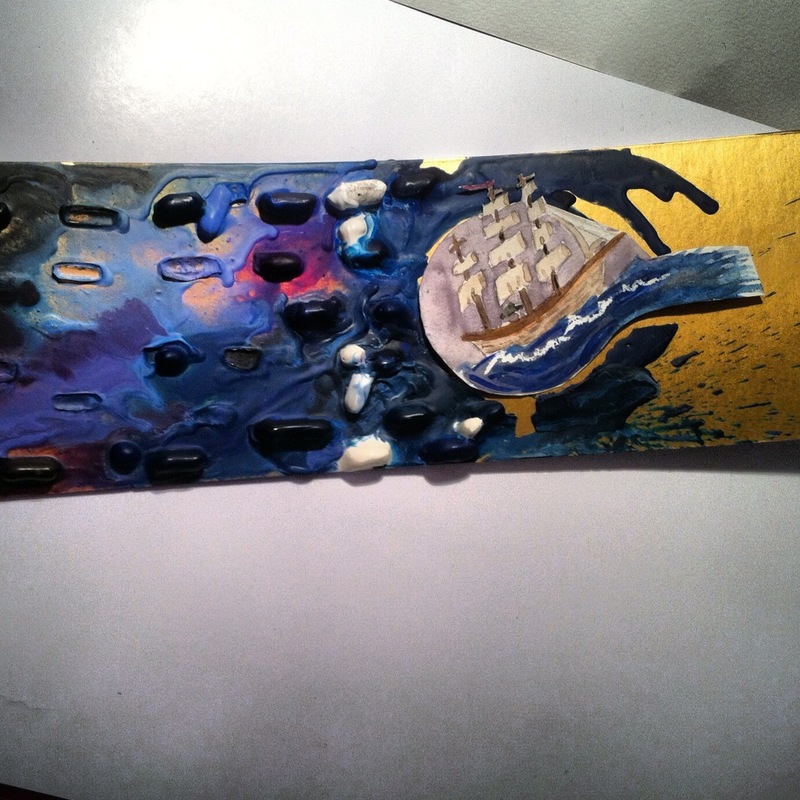 This melted wax design reminded me of a wave, so I added the watercolor ship design in later on. 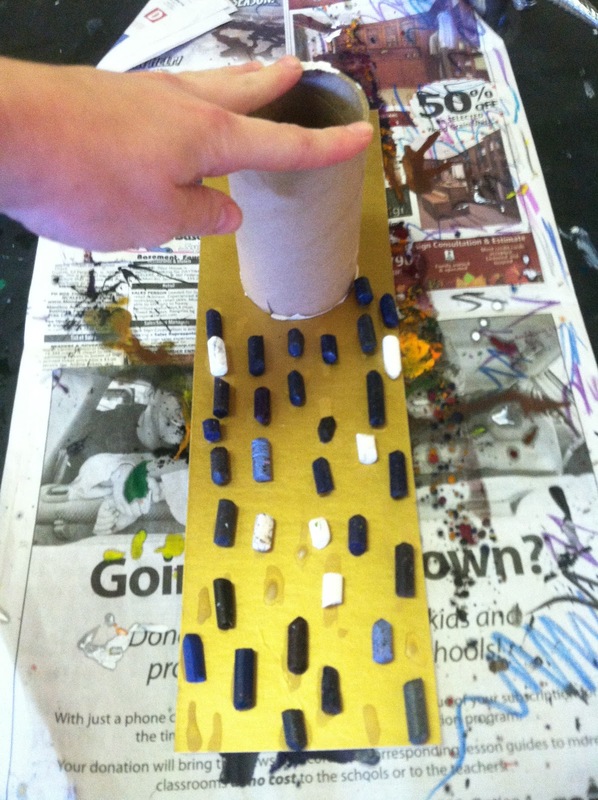 As we discovered through trial and error during this unit, some designs work better than others. This circle just turned into a mess of colors and was not very interesting. This heart worked well because the student directed the wax with the hair dryer to the outside edges. 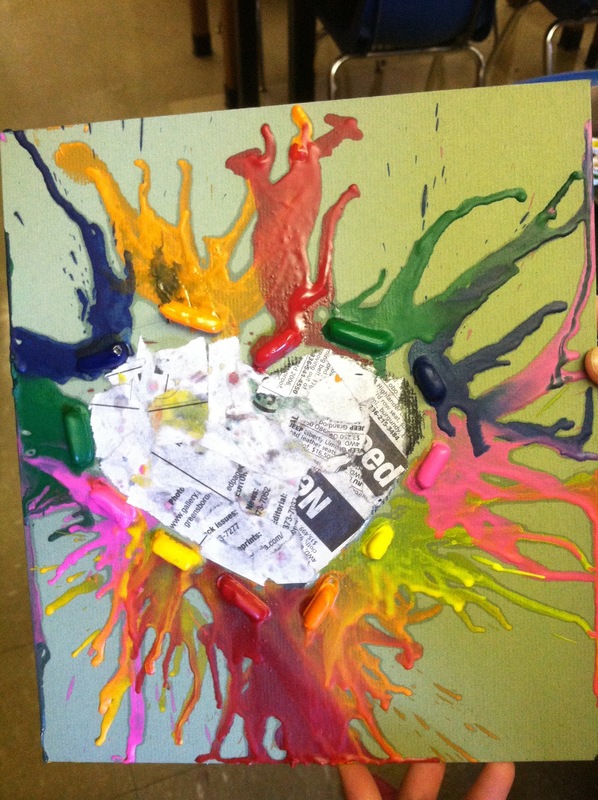 She then filled in the interior of the heart with collage. This piece turned into an almost Chagall-like stained glass window of colors. 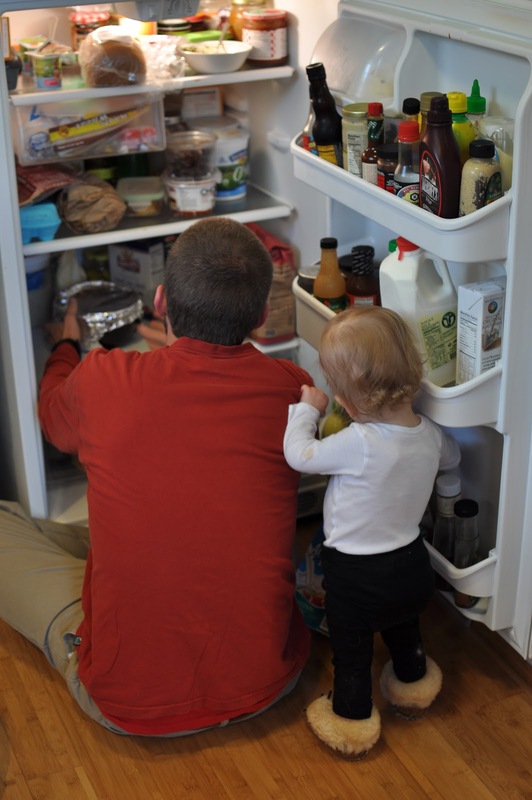 We started Thanksgiving off with baking and cooking and a fridge clean-out to make room for the goods. Greta was a big helper to Eric’s fridge cleaning. She wanted to carry the salad dressing bottles. We gathered at a friend, Mary Elise and David’s house with Julie and Dipesh for a noon-time meal. This was a perfect time since all three families have children. 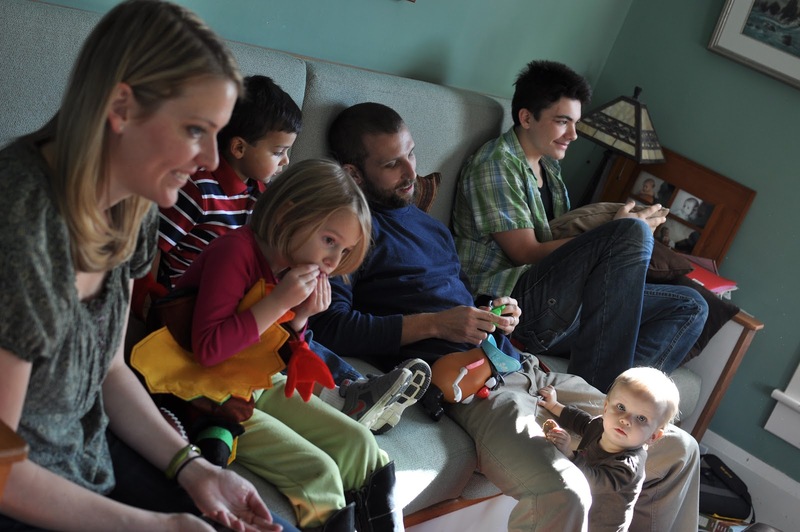 These gatherings are always a hoot – my family away from Iowa home. There was plenty of time to sit around and watch football. The table was a work of art in itself. Mary Elise was, as always, a gracious host. 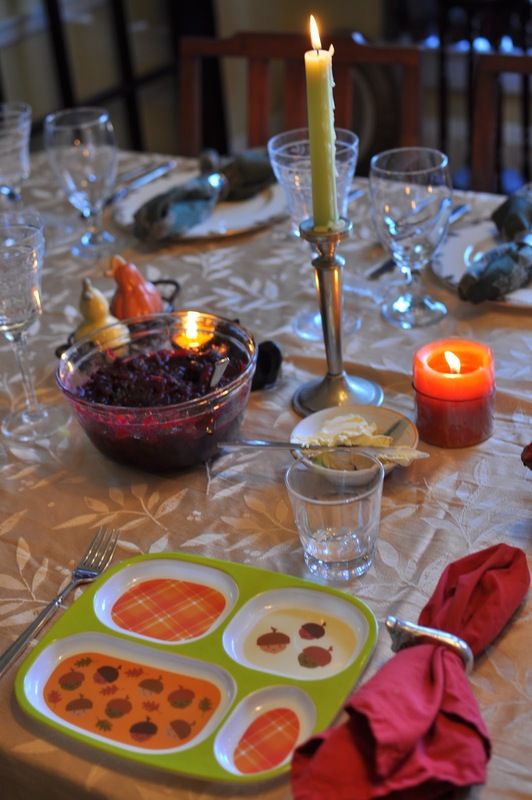 Greta had her own Thanksgiving plate that was not family heirloom wedding china. 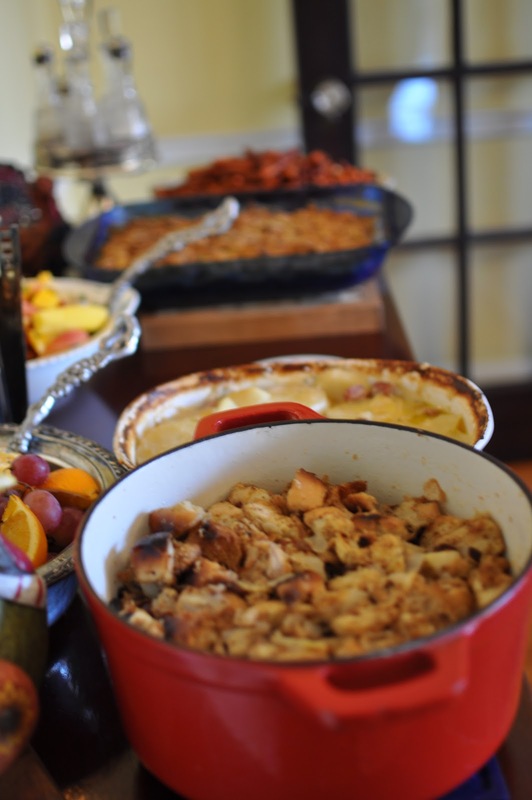 The spread was incredible – Apple Raisin stuffing, ham scalloped potato casserole, fruit, turkey legs, ginger cranberry relish (described as exploding rainbows and unicorns, I might add! ), rolls, balsamic roasted carrots, green bean casserole, and mashed potatoes. Most of these items were vegan – you would never have even guessed though. 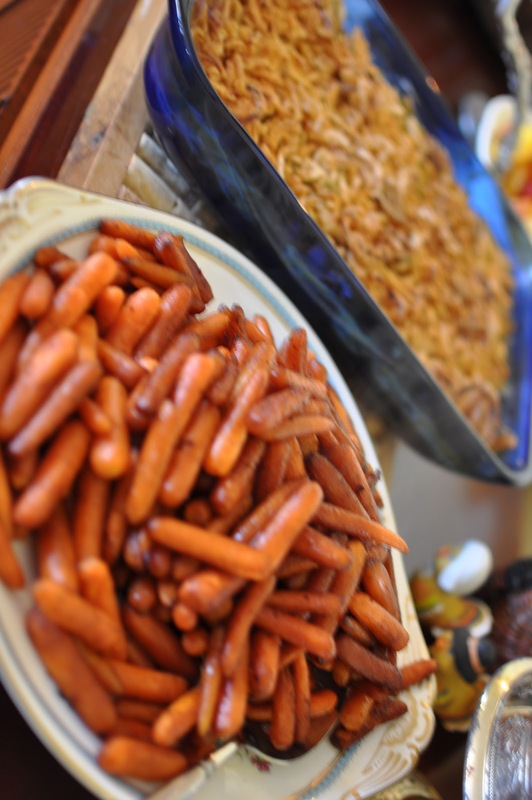 The green bean casserole and balsamic carrots were the most popular dishes. 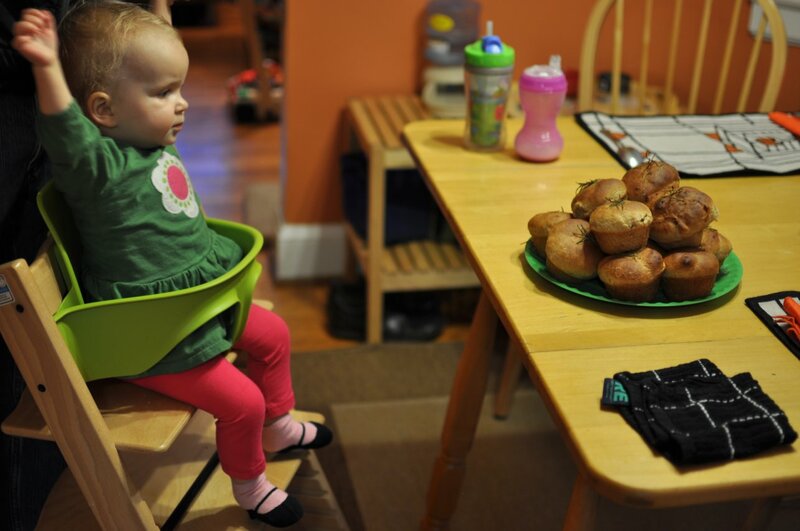 We all gathered around to eat, even Greta sat in a big girl chair. We wrapped up the meal with apple pie and vegan pumpkin pie. Oh yes, best one yet. Check out the flaky crust on this baby. The final part of this gathering was the obligatory group photo. 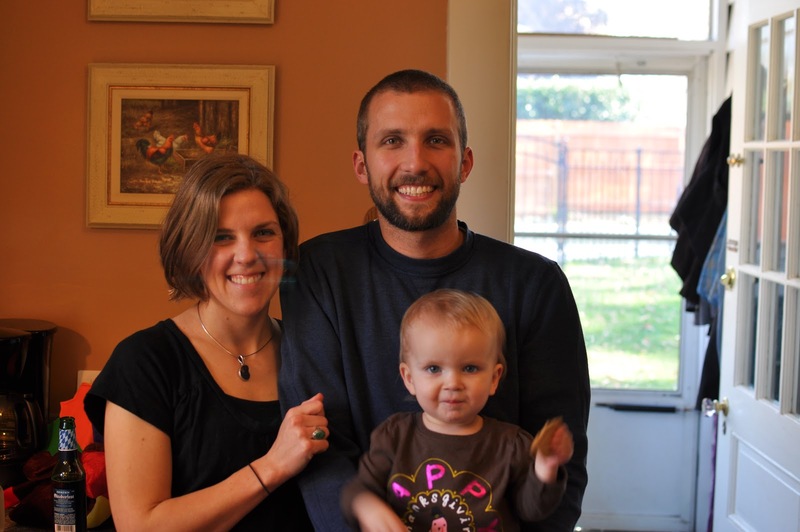 Had this photo been taken 8 years ago when I first met Julie and Mary Elise, it would have been just the 6 adults. My how time flies! For my apple pie, the recipe is as follows. 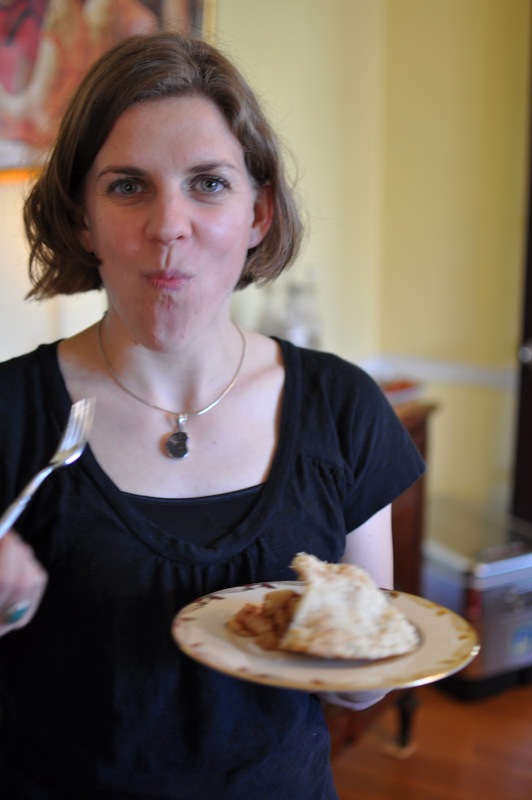 I am giving away major secrets here, so I hope to hear that all of you are making apple pies soon. 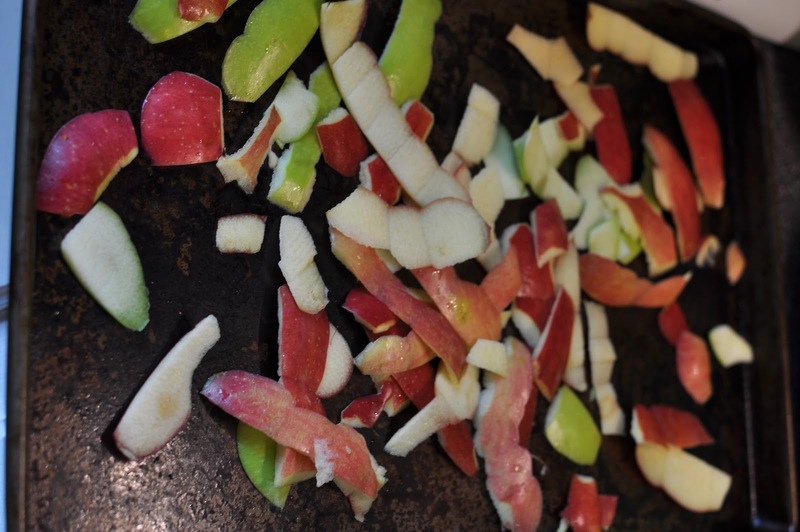 For the filling, peel and slice 3 lbs of apples (about 5 medium to large), mixed variety. I heard this secret from a friend, who spoke to an apple grower at farmer’s market about apple pie secrets. 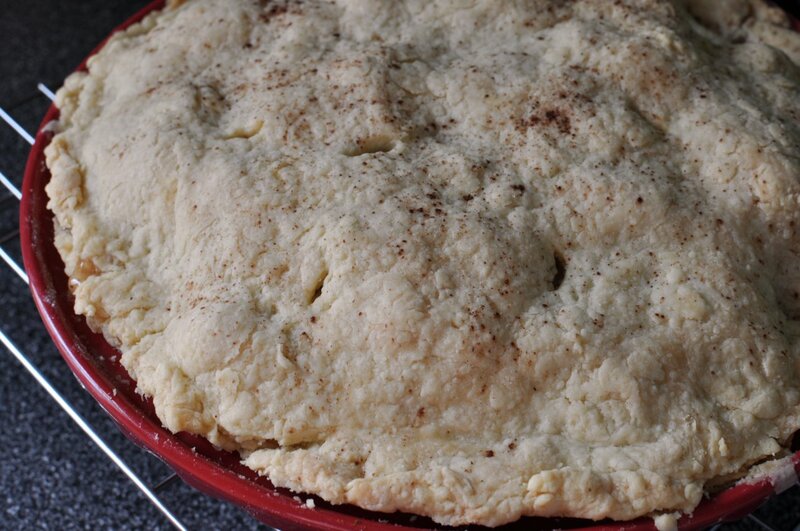 I used Fuji, Granny Smith, and Braeburn for this pie. 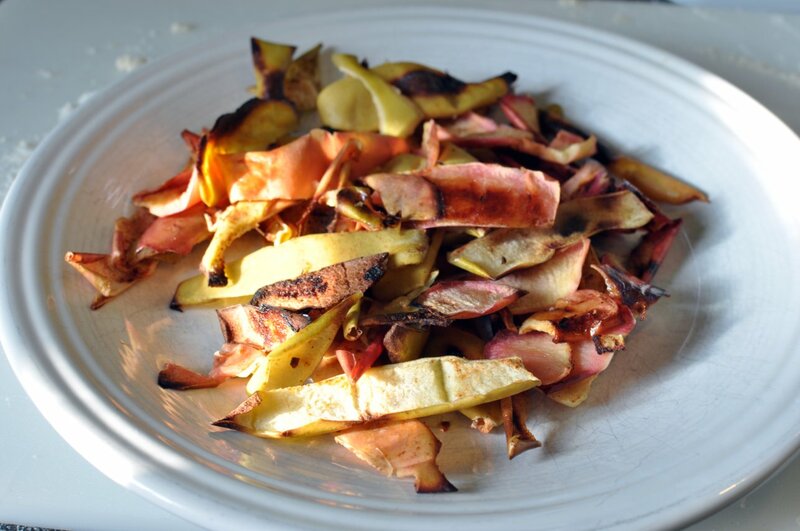 I saved my apple peels, spread them out on a baking sheet, sprinkled them with cinnamon and sugar and baked at 350 degrees for 25 to 30 minutes or til dried. They make a great snack! 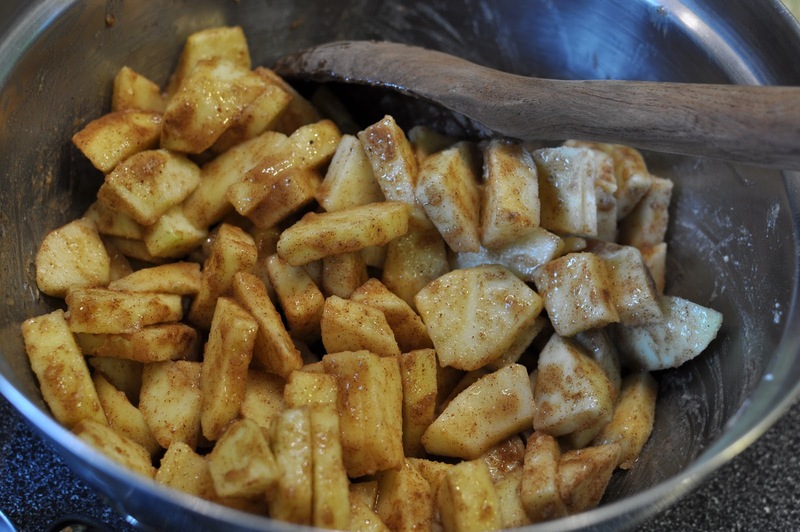 Place apples in a large mixing bowl and add 2 tablespoons lemon juice, 1/4 cup sugar, 3 tablespoons nutmeg, 1 tablespoon cinnamon, and 1/4 teaspoon nutmeg. Set aside. 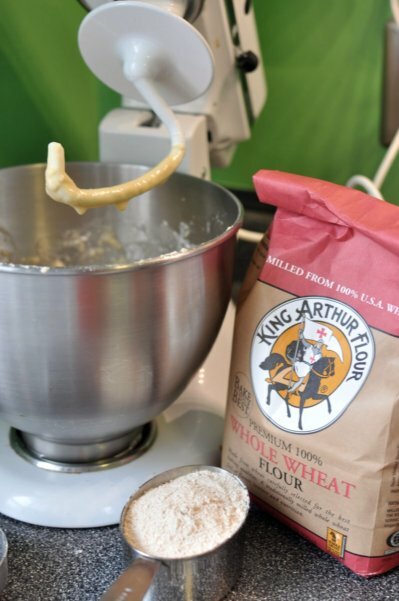 For the double-crust, in a medium mixing bowl, cut 1/3 cup cold butter into 2-1/4 cups flour. Use a pastry blender until the pieces are pea sized. Sprinkle 1 tablespoon ice cold water or vodka over part of the flour mixture, toss with a fork. Push aside moistened dough, repeat using 1 tablespoon of water/vodka at a time (8-10 tablespoons total) until all flour is moistened. Do not over moisten. 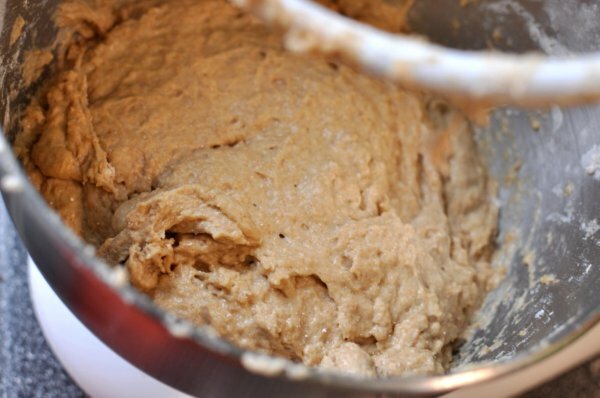 Divide dough into two balls, dough should be crumbly and semi-dry. I used 4 tablespoons ice water and 4 tablespoons iced vodka for the perfect crust. 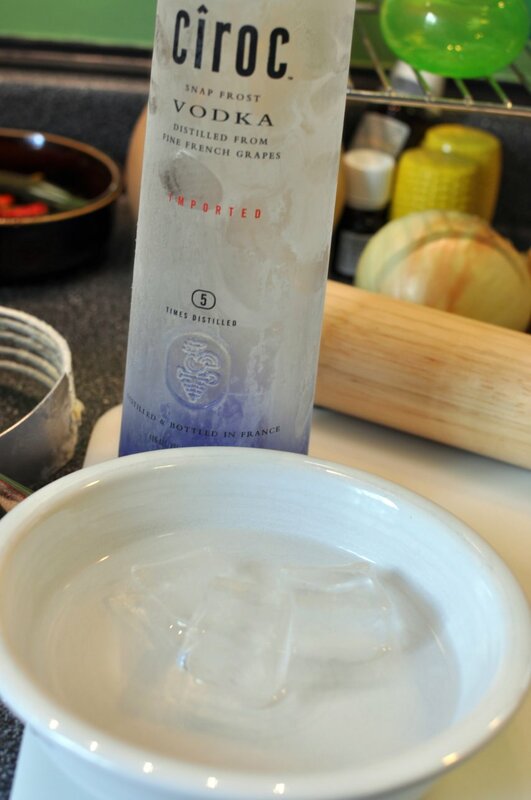 I put ice cubes in a bowl and keep the vodka in the freezer to keep the crust as cold as possible. 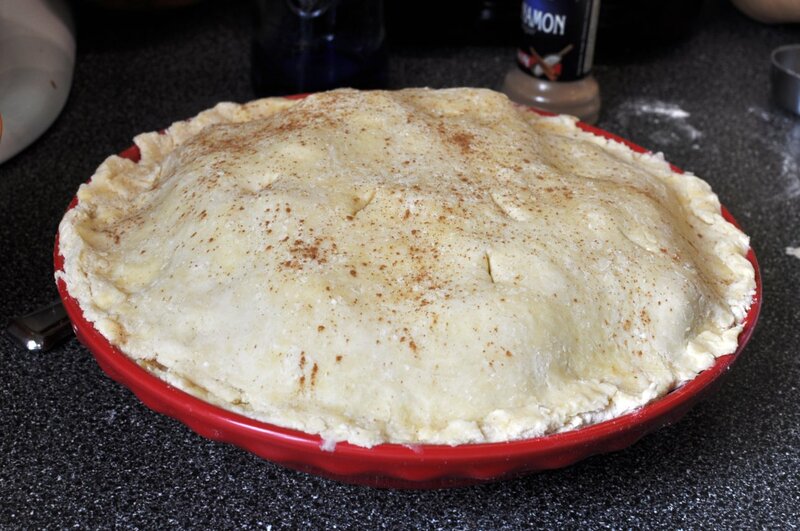 The other key to a perfect pie is working fast so the dough does not get too warm. Take a break and refrigerate the dough if it gets too warm. 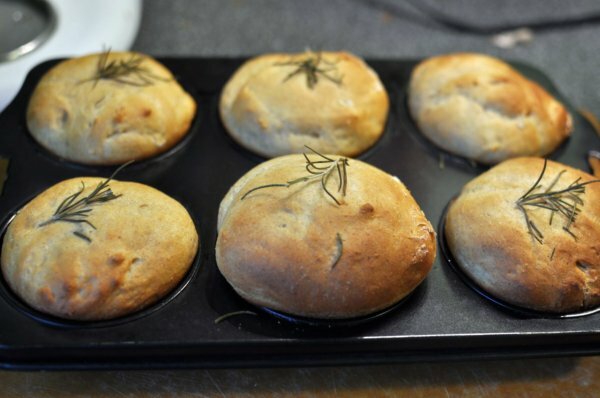 On a lightly floured surface, use your hands to slightly flatten 1 dough ball. Roll from center to edges into a circle about 12 inches in diameter. 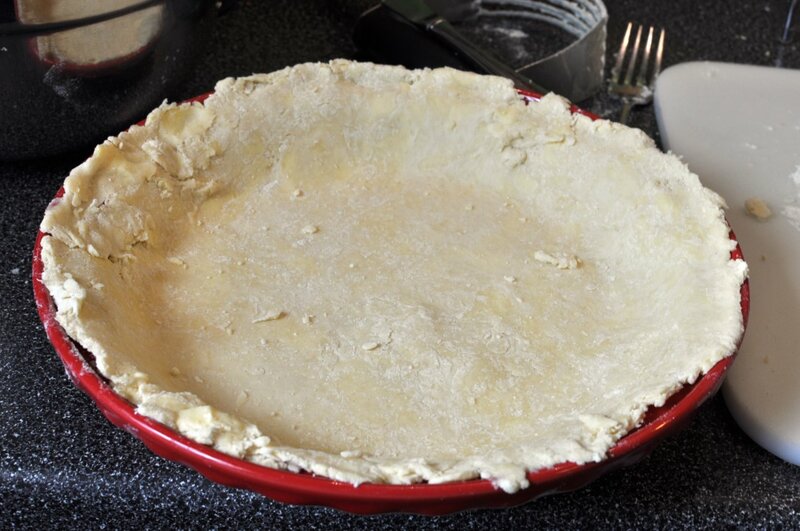 Transfer to a pie plate by carefully wrapping dough around a rolling pin, being careful not to stretch the dough. Trim extra dough. Transfer apple filling to pie plate. Roll remaining dough ball into a circle about 12 inches in diameter. Place on top of filling, press edges together, trimming extra. Cut steam vents in the top of the dough. 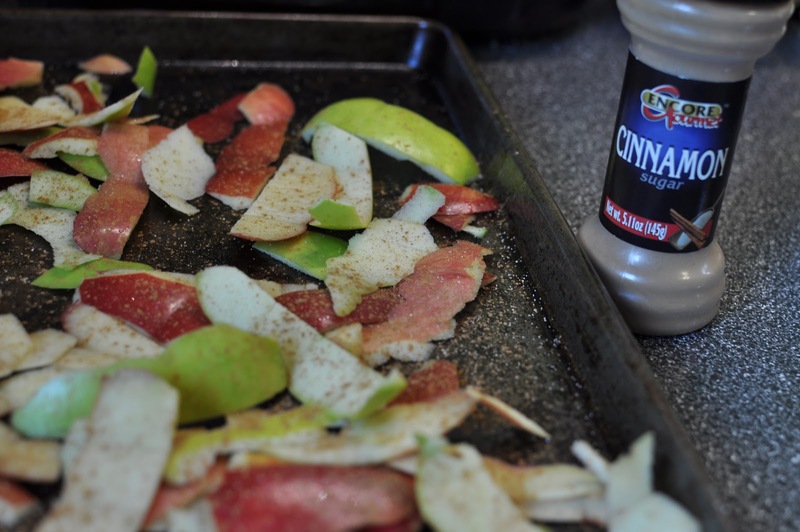 Sprinkle with cinnamon and sugar. 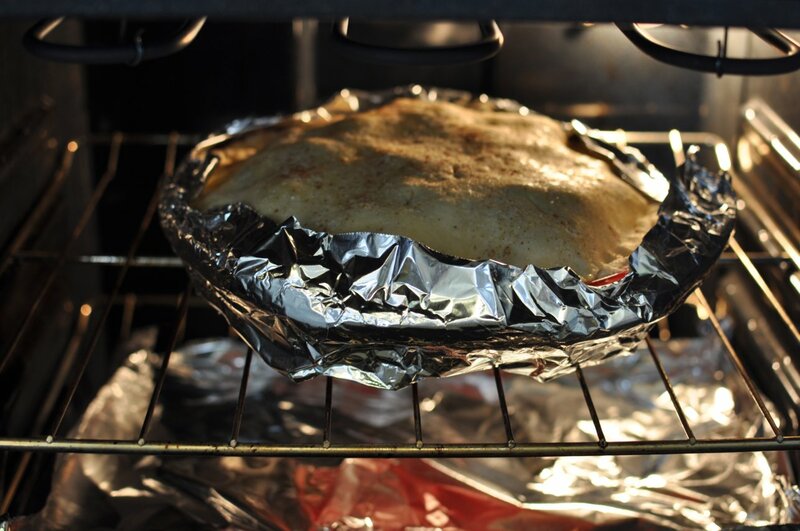 Cover edges in foil and bake at 400 degrees for 20 to 25 minutes. Remove foil, reduce heat to 350 degrees and bake for 35 to 45 more minutes. 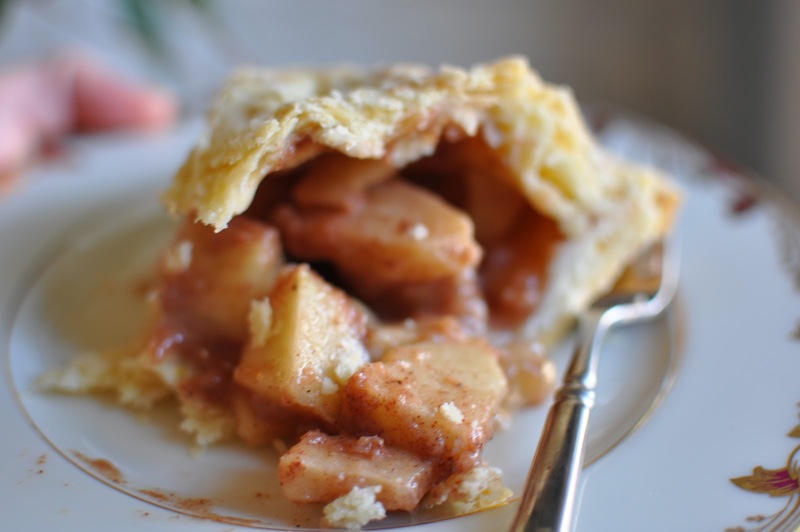 Filling should be bubbly and hot and top of pie slightly golden. Cool on a wire rack. 1. 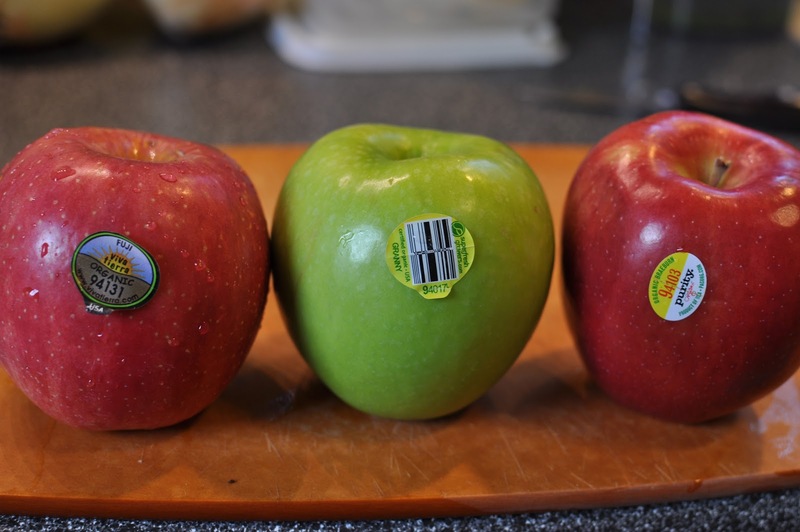 For the filling, peel and slice 3 lbs of apples (about 5 medium to large), mixed variety. 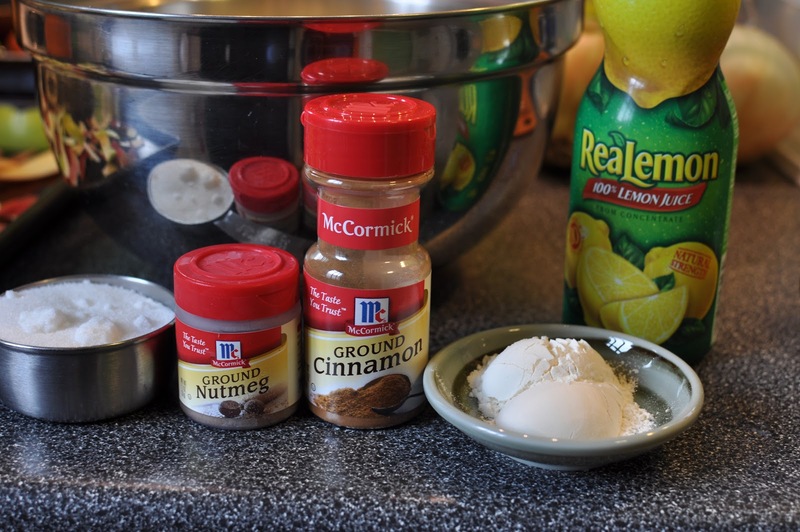 Place in a large mixing bowl and add 2 tablespoons lemon juice, 1/4 cup sugar, 3 tablespoons nutmeg, 1 tablespoon cinnamon, and 1/4 teaspoon nutmeg. Set aside. 2. 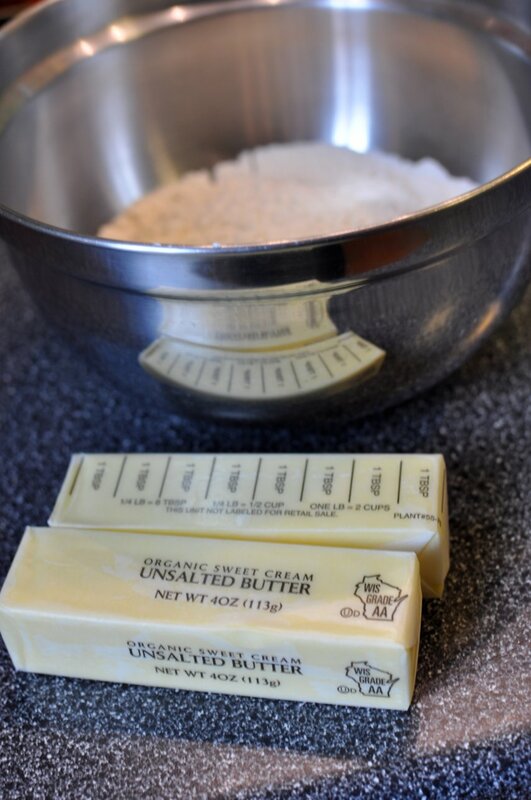 For the double-crust, in a medium mixing bowl, cut 1/3 cup cold butter into 2-1/4 cups flour. 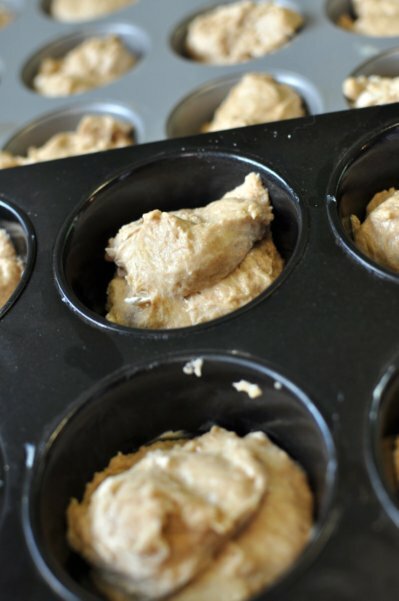 Use a pastry blender until the pieces are pea sized. 3. 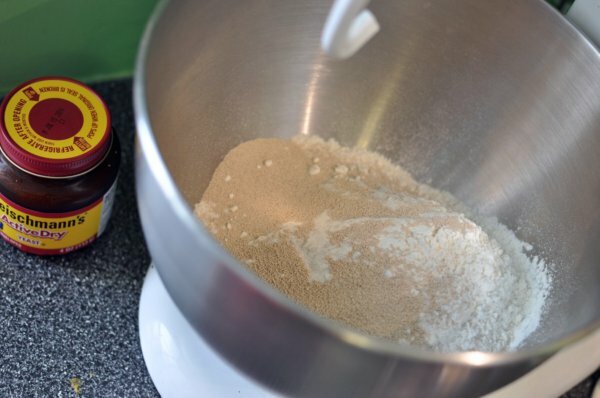 Sprinkle 1 tablespoon ice cold water or vodka over part of the flour mixture, toss with a fork. 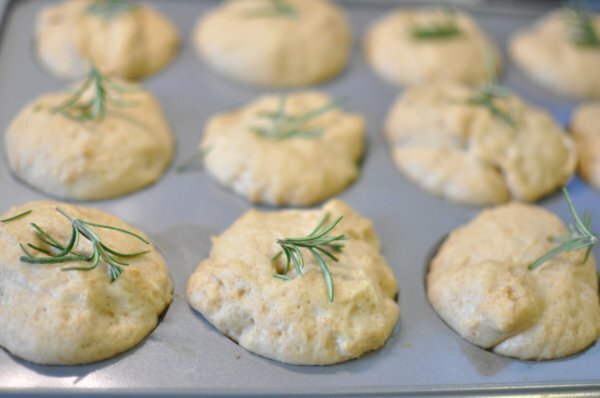 Push aside moistened dough, repeat using 1 tablespoon of water/vodka at a time until all flour is moistened, 8-10 tablespoons total. Do not over moisten. 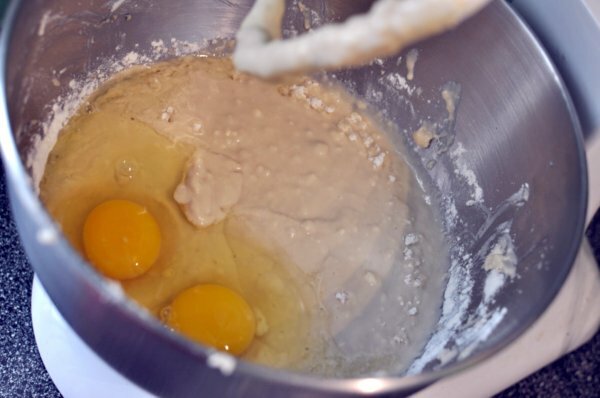 Divide dough into two balls, dough should be crumbly and semi-dry. 4. On a lightly floured surface, use your hands to slightly flatten 1 dough ball. Roll from center to edges into a circle about 12 inches in diameter. Transfer to a pie plate by carefully wrapping dough around a rolling pin, being careful not to stretch the dough. Trim extra dough. 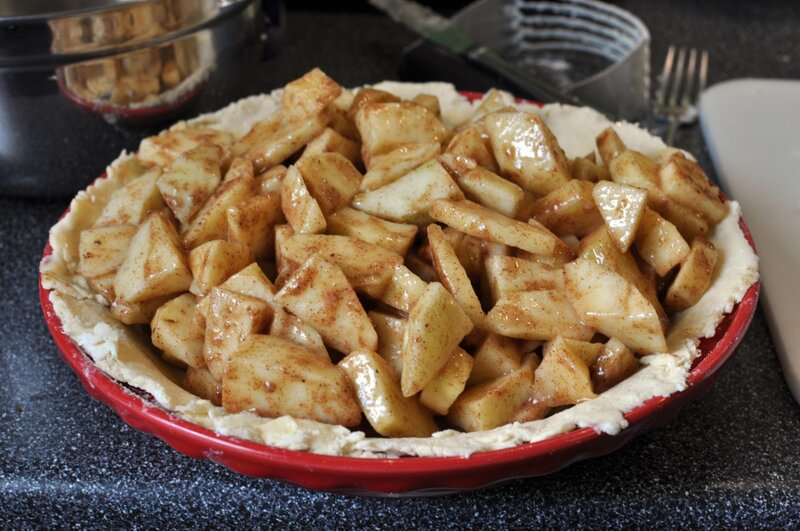 Transfer apple filling to pie plate. 5. Roll remaining dough ball into a circle about 12 inches in diameter. Place on top of filling, press edges together, trimming extra. Cut steam vents in the top of the dough. Sprinkle with cinnamon and sugar. 6. Cover edges in foil and bake at 400 degrees for 20 to 25 minutes. Remove foil, reduce heat to 350 degrees and bake for 35 to 45 more minutes. 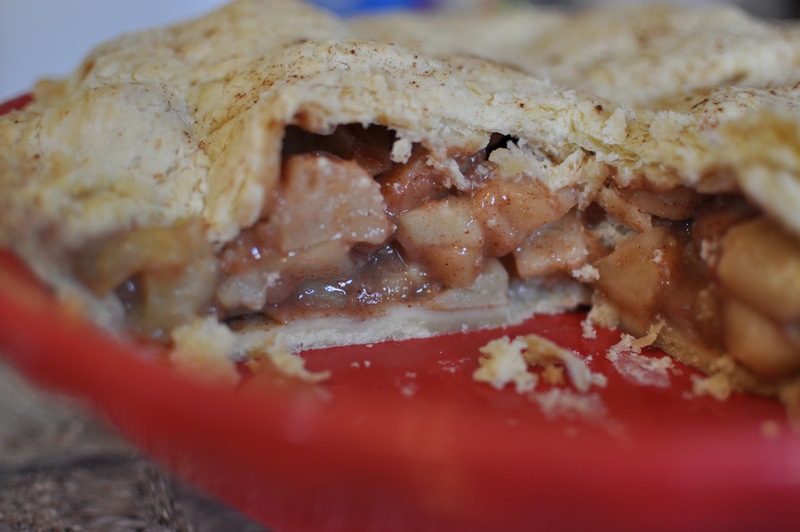 Filling should be bubbly and hot and top of pie slightly golden. What have you done so far today? I was up at 6 AM making apple pie (my best one yet!) and this yummy cranberry relish. 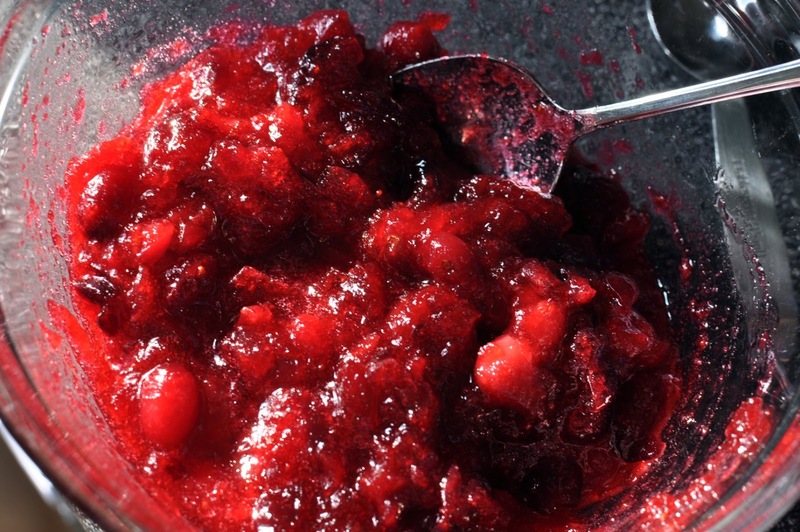 Today is the perfect time to make your Thanksgiving day cranberry sauce. This is one I have been making since 2007. 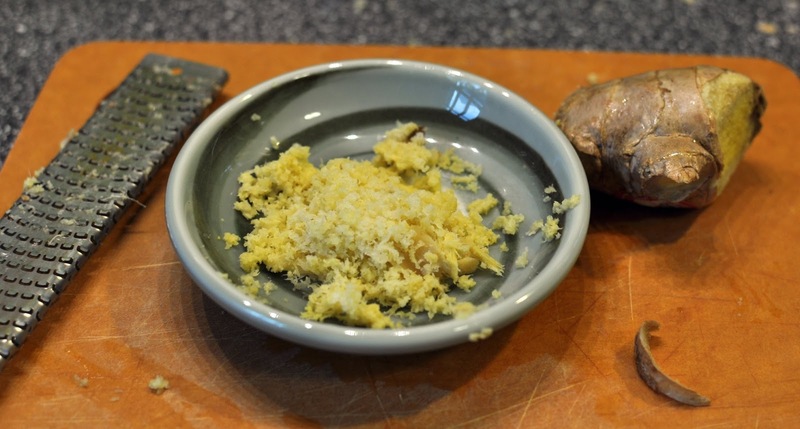 It has the perfect zing with the addition of fresh grated ginger. More on that pie later. Enjoy your day! 1. In a large saucepan, bring 12 oz of cranberries, 1 cup sugar, 2 tablespoons water, 1 tablespoon grated fresh ginger to a boil. Reduce heat to low and summer until most of the cranberries have popped, 10 to 15 minutes. Stir in 2 tablespoons red-wine vinegar. 2. Remove relish from heat. Let cool to room temperature, and serve. Or refrigerate in an air-tight container for up to 3 days. Here is another option for a Thanksgiving side. 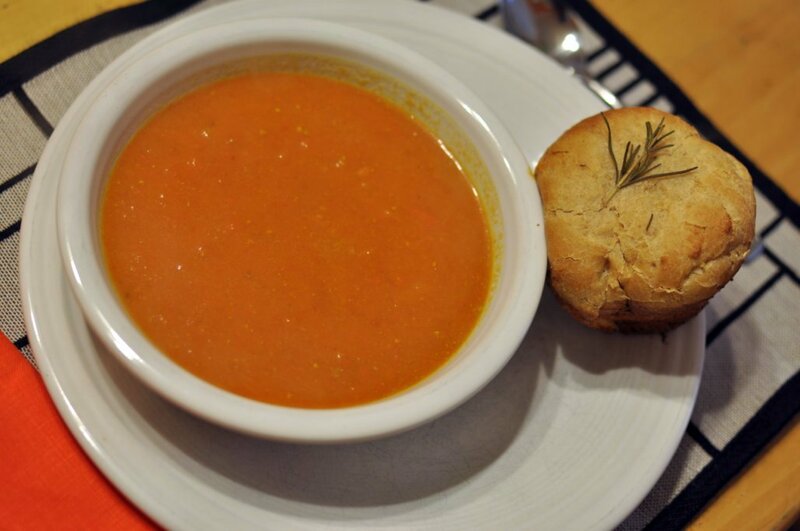 Soup is a fantastic way to feed a large crowd, especially as a starter or a side. This can be made a day or two in advance and refrigerated or even frozen a week or more in advance. Simply put in the slow cooker on warm. Be sure to plug this in somewhere out of the way to leave more room for the preparation for the rest of your Thanksgiving dishes. 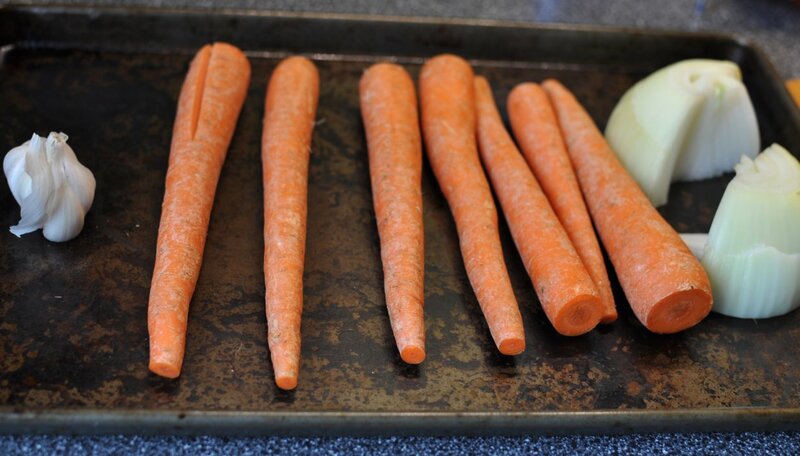 Place 7 – 10 large carrots, 1/2 – 1 yellow onion, 1 garlic head, bottom edge trimmed off, on a rimmed baking sheet. Spray with olive oil and bake at 400 degrees for 40 minutes, rotating half way through. Vegetables should be soft and blackened when cooked fully. Allow vegetables to cool, enough to handle. 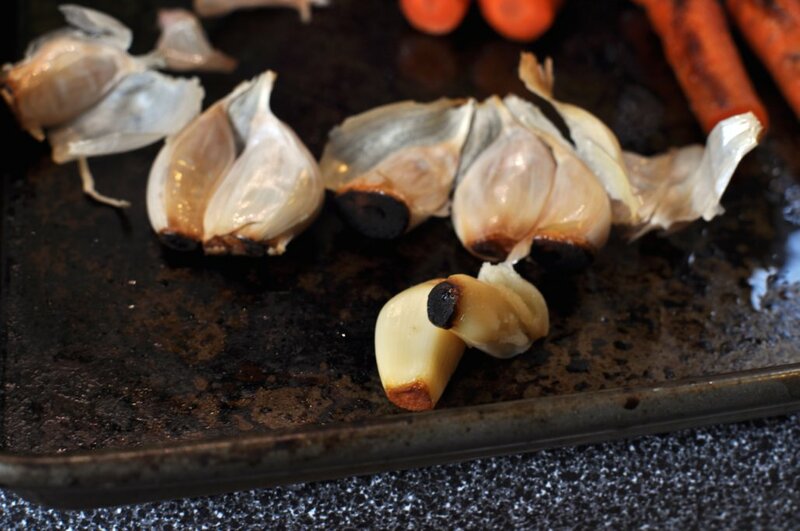 Peel the garlic and slice off blackened bottom edge. Place vegetables in a blender or food processor. Blend with 1-1/4 cup milk (I used unsweetened almond milk) and 1 cup broth until smooth and pureed. 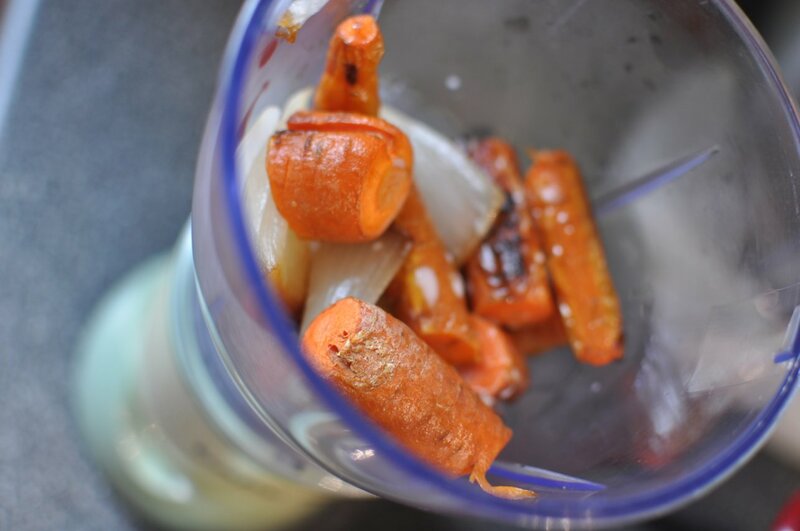 Cut off about 2 inches of ginger root, peel, and blend with the carrot puree. 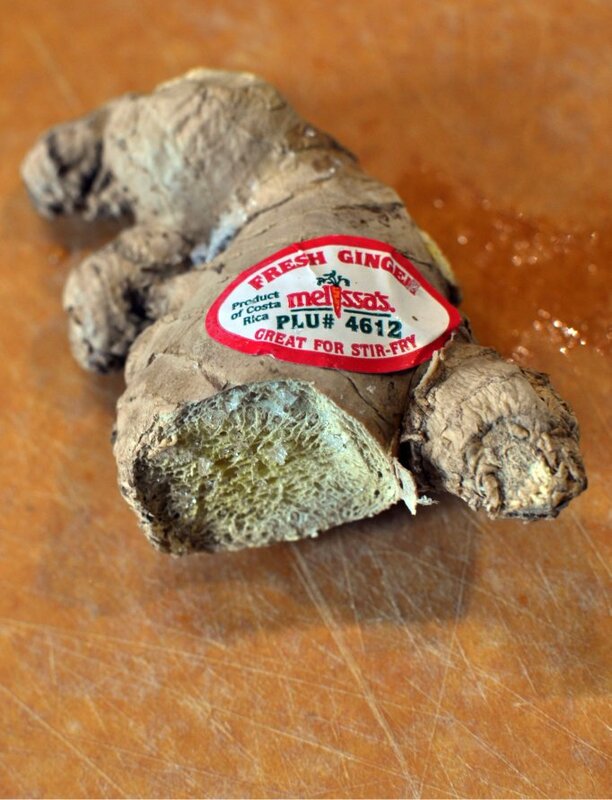 I keep my ginger root frozen and use a sharp knife to cut off what I need. 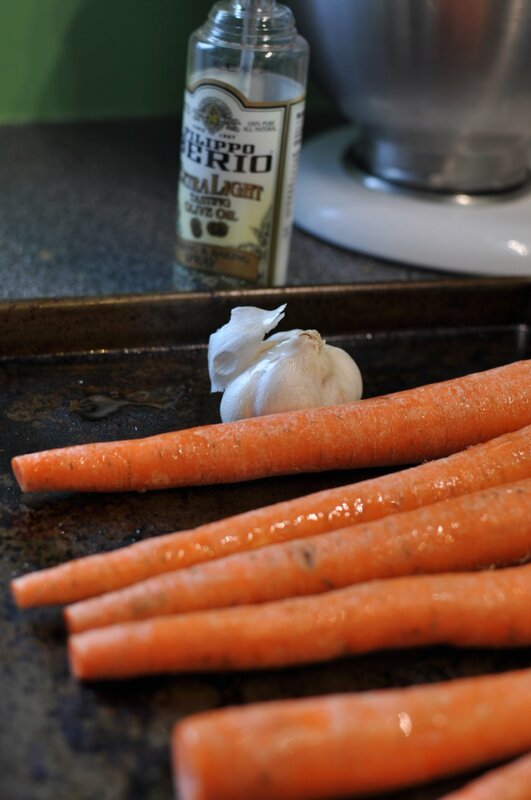 Place the carrot puree into a slow cooker, mix in 1 cup water and 1 cup of broth, stir well. Cook on low for 5 to 6 hours. 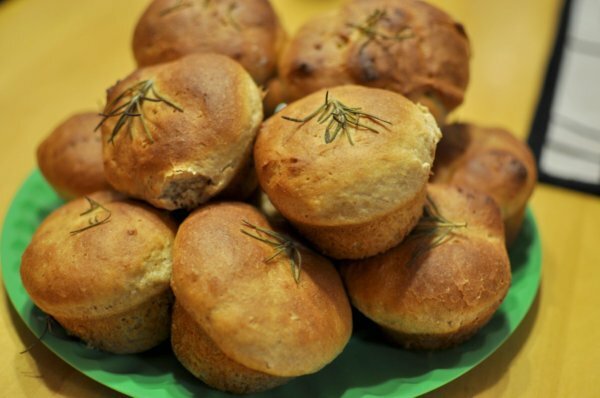 Serve warm with Easy Rosemary Wheat Rolls. 1. 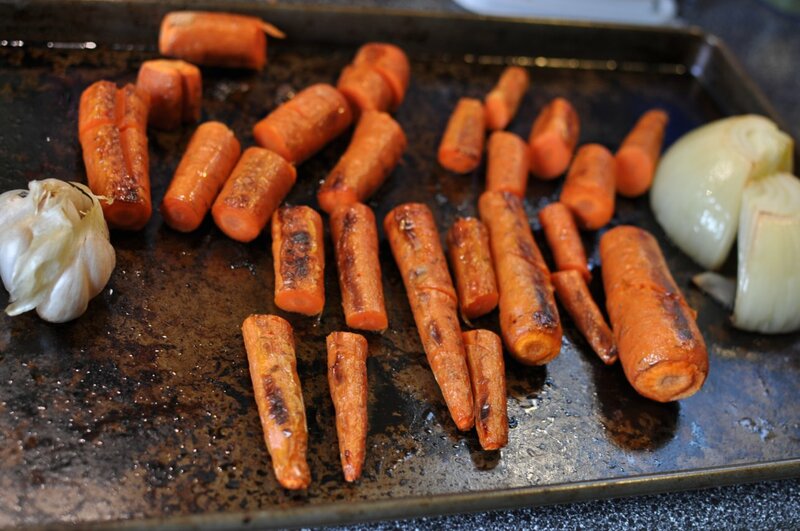 Place 7 – 10 large carrots, 1/2 – 1 yellow onion, 1 garlic head, bottom edge trimmed off, on a rimmed baking sheet. 2. Spray with olive oil and bake at 400 degrees for 40 minutes, rotating half way through. 3. Vegetables should be soft and blackened when cooked fully. Allow vegetables to cool, enough to handle. Peel the garlic and slice off blackened bottom edge. 4. Place vegetables in a blender or food processor. 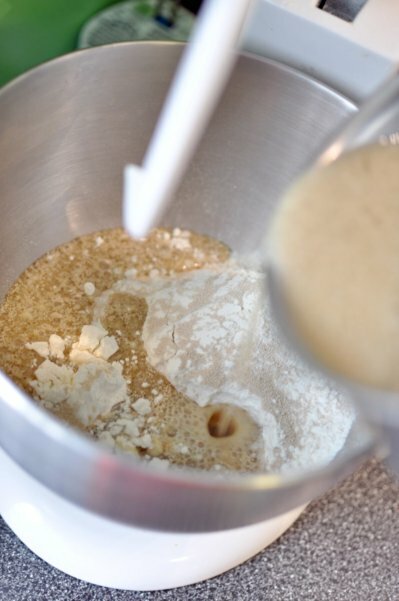 Blend with 1-1/4 cup milk and 1 cup broth until smooth and pureed. 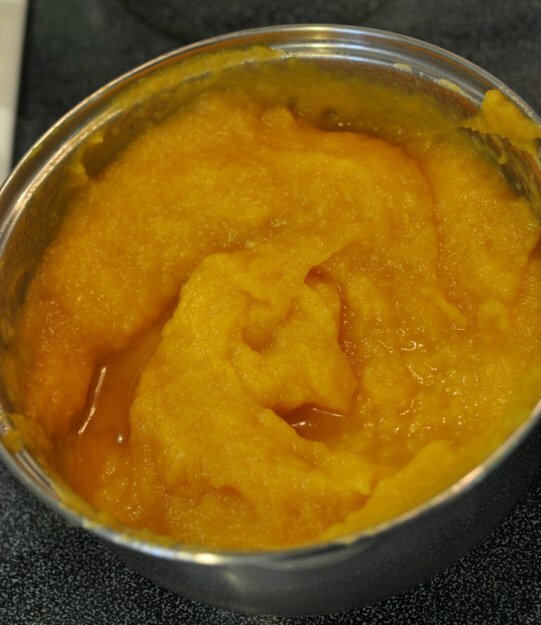 Cut off about 2 inches of ginger root, peel, and blend with the carrot puree. 5. 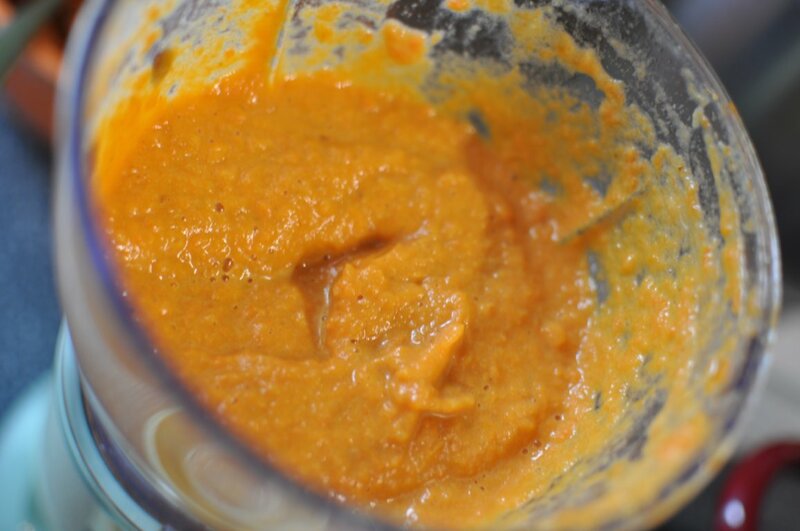 Place the carrot puree into a slow cooker, mix in 1 cup water and 1 cup of broth, stir well. Cook on low for 5 to 6 hours. 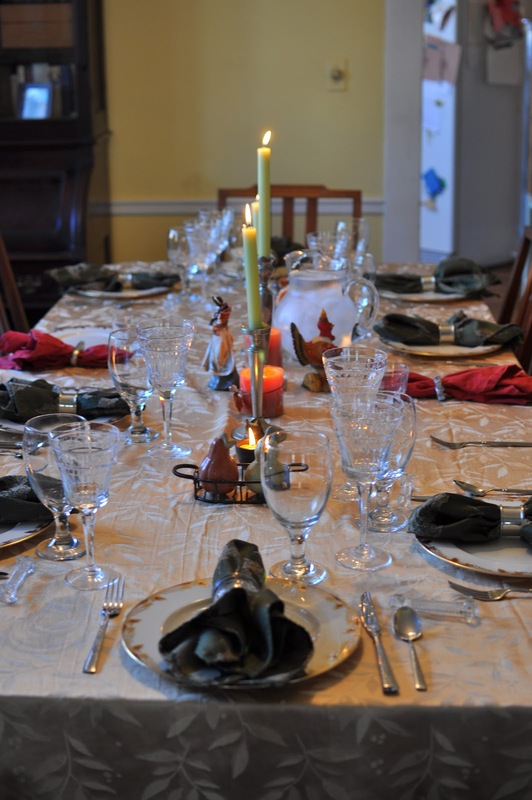 I am so excited for Thanksgiving – it is easily one of my favorite holidays. A partial week of work, time to spend with loved ones, time off for projects, time to cook and bake, and of course time to enjoy the food of the season. 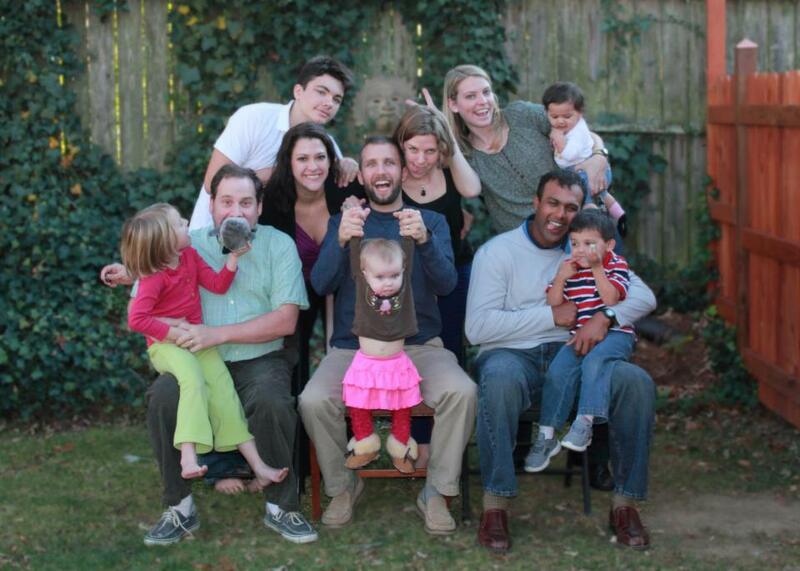 This year we are staying home in North Carolina for Thanksgiving – our plans are still under construction. But it is never too soon to start thinking about the menu. I usually like to keep it to about 4 sides but in a large amount so we have plenty of leftovers. 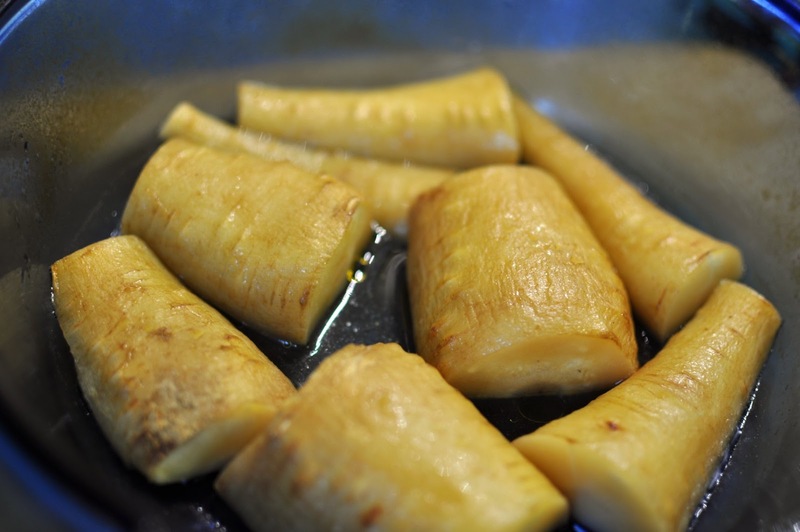 Baked parsnips are an easy way to prepare parsnips and it brings out the delicious subtle flavor of these root veggies. 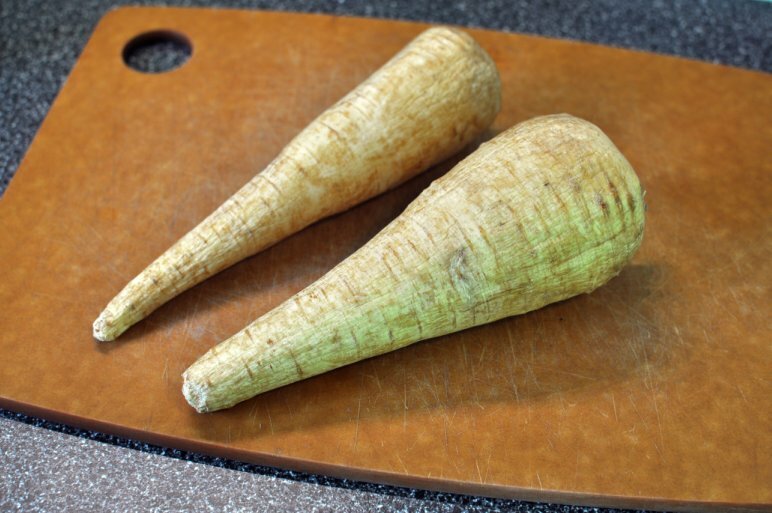 I find that parsnips have a better flavor than potatoes which means they need less (or none) of the (unhealthy) flavorings like butter, milk, and salt. Cut 2 parsnips in half lengthwise. Remove the core, if it’s woody, discard. Place in a baking dish sprayed with olive oil. Cut in half, vertically, if this helps them to fit into your dish. Cover with 3/4 cup broth. Serve with butter or margarine and fresh squeezed lemon. Check back this weekend and into next week for more easy Thanksgiving ideas! 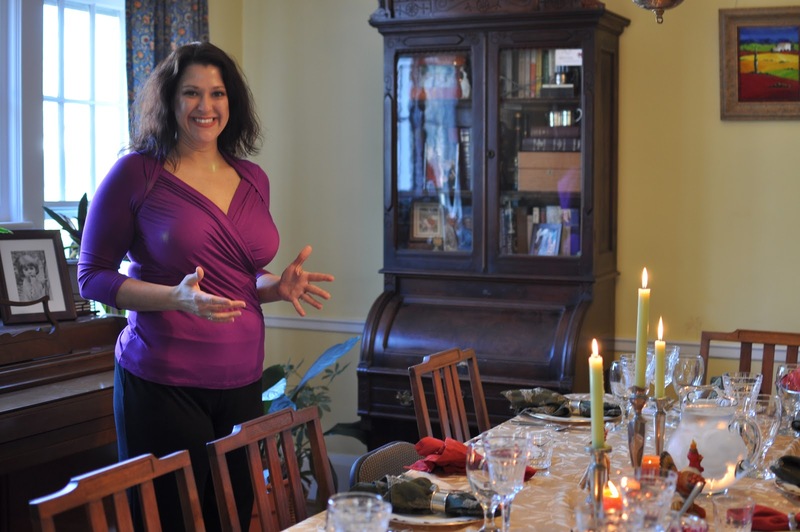 I’d love to hear what you are planning on eating/making for Thanksgiving this year. 1. 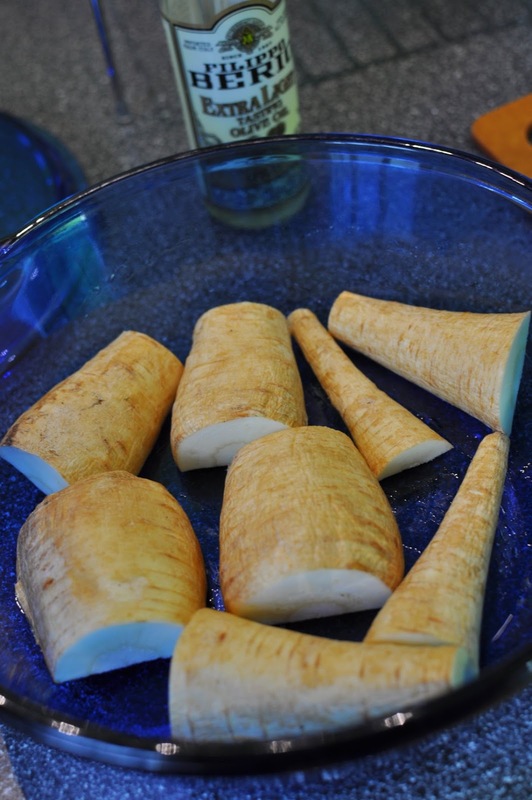 Cut 2 parsnips in half lengthwise. Remove the core, if it’s woody, discard. 2. Place in a baking dish sprayed with olive oil. 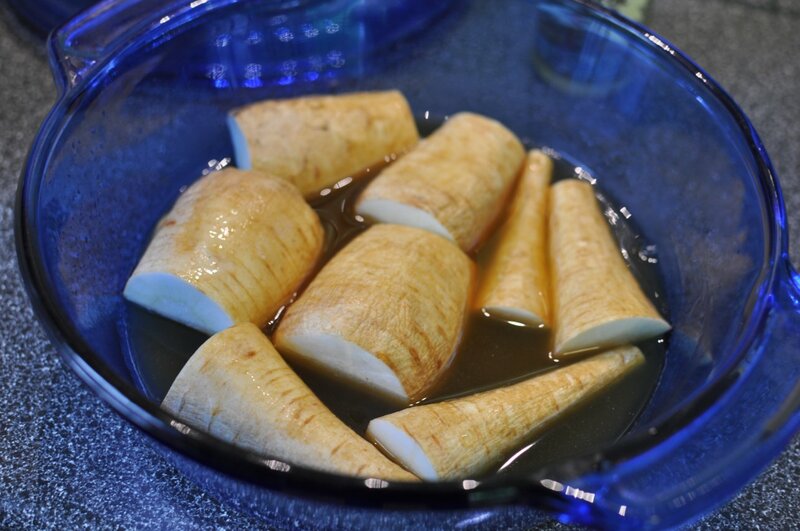 Cover parsnips with 3/4 cup broth. 3. Cover and bake at 375 degrees for 45 minutes. Serve with butter or margarine and fresh squeezed lemon. Greta has been home sick the past couple days. Yesterday afternoon she napped for a lengthy four hours. 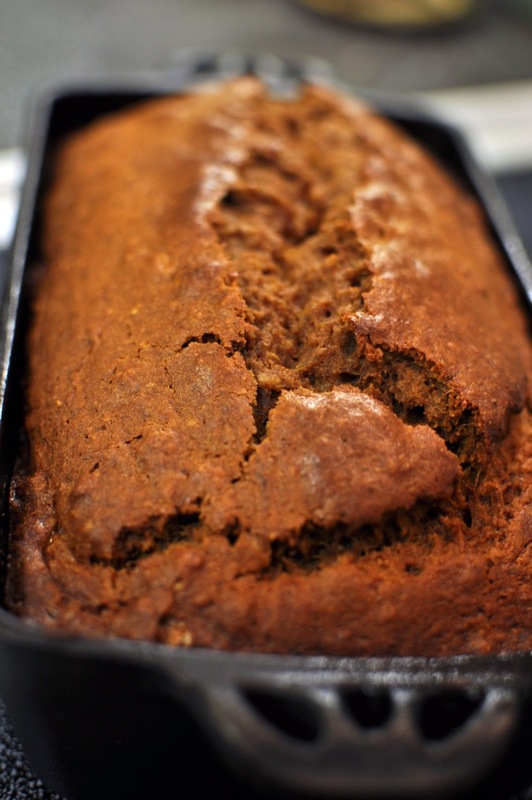 In that time, I worked on lesson plans, organized the kitchen, and baked banana pumpkin bread. This is a recipe my sister gave me at my bridal shower and it’s only taken me 5 some years to try it out. I wish I had tried it much sooner. 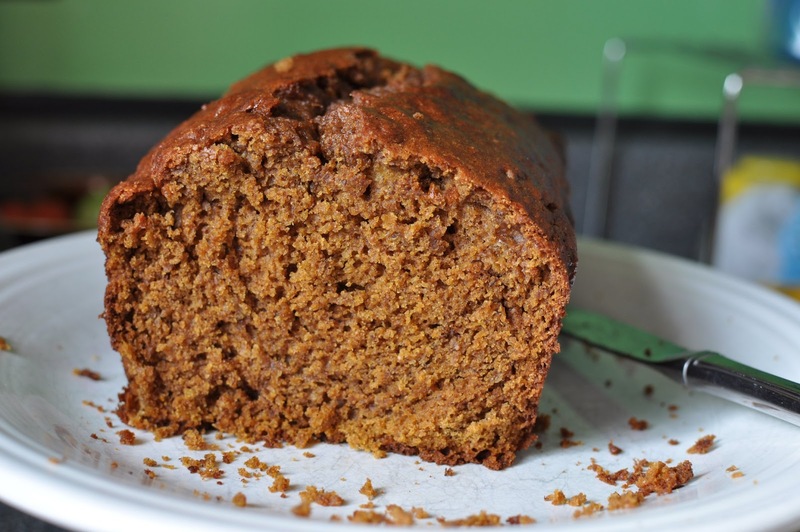 The molasses adds such a warm autumn taste to this bread. We are already missing half of the loaf and Eric threatened to take the other half with him for his lunch today. Try this out with only bananas or half banana and half pumpkin, as shown below. Grease a loaf pan. Combine 2 cups whole wheat flour, 1 teaspoon baking soda, 1 teaspoon cinnamon, 1/4 cup wheat germ, and 1/8 teaspoon nutmeg in a bowl. 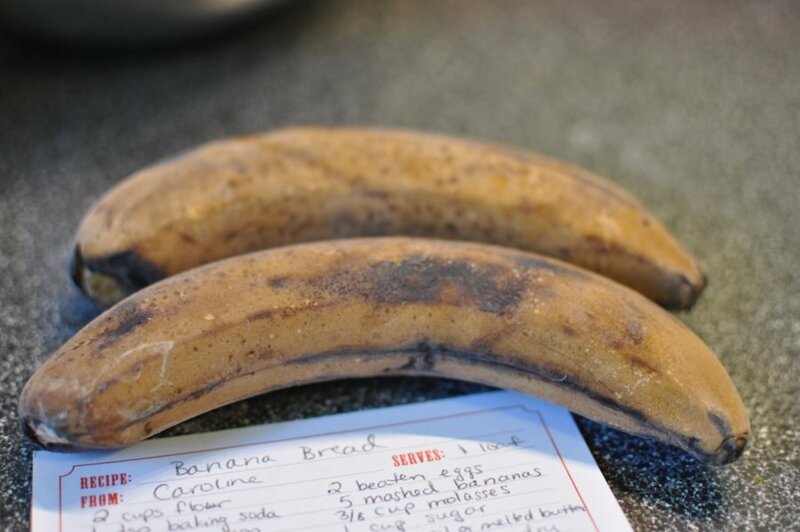 I always freeze extra really ripe bananas so I have them on hand. 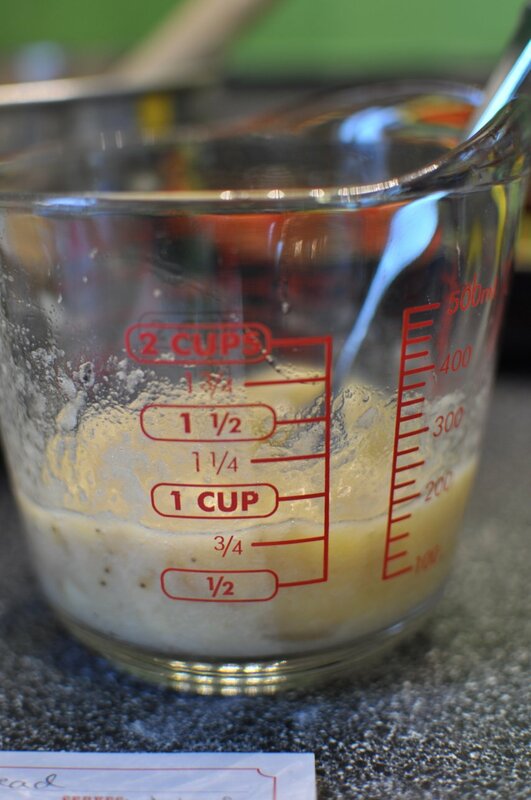 When I am ready to bake banana bread, I simply defrost them in the microwave and then mash them in a glass measuring cup. 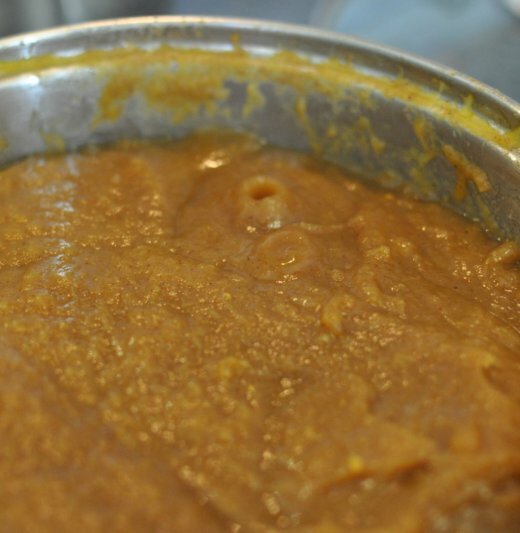 For this recipe, I combined mashed banana and pumpkin puree to create the 1-1/2 cups needed. 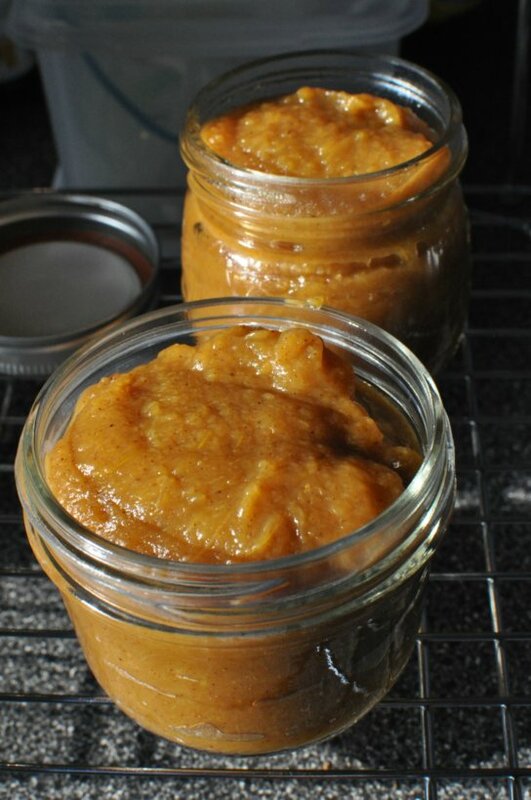 Combine 2 eggs, 1-1/2 cups mashed banana and pumpkin puree, 3/8 cups molasses, 1 cup sugar, 1/2 oil or melted butter. Stir just until moistened. Pour batter into prepared loaf pan. I have a cast iron loaf pan that I use all the time. It is sturdy, cooks foods evenly, and easy to remove baked goods because it stays greased. I highly recommend using one of these pans. Bake in a 350 degree oven for 60 minutes or until a toothpick inserted in the middle comes out clean. Cool in pan 10 minutes, then remove to cool on wire rack. Enjoy, I am off to work on some more lesson ideas, but before I do that, I have something fun for you to try. 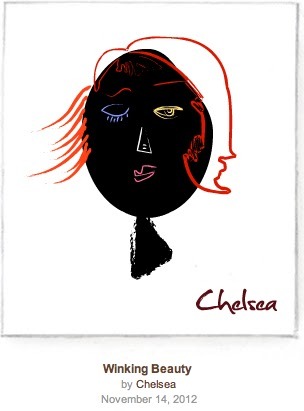 It’s a creative website called Mr. Picassohead where you can create your own drawing in the style of Pablo Picasso. I made one called Winking Beauty. 1. 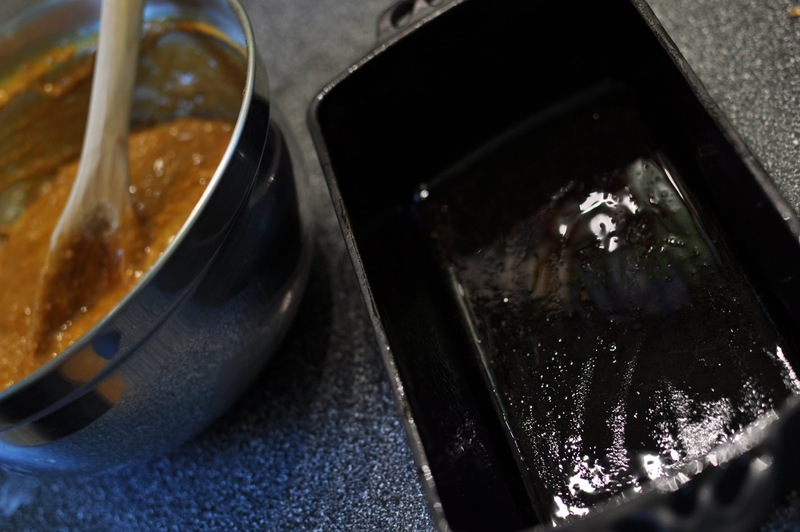 Grease a loaf pan. Combine 2 cups whole wheat flour, 1 teaspoon baking soda, 1 teaspoon cinnamon, 1/4 cup wheat germ, and 1/8 teaspoon nutmeg in a bowl. 2. 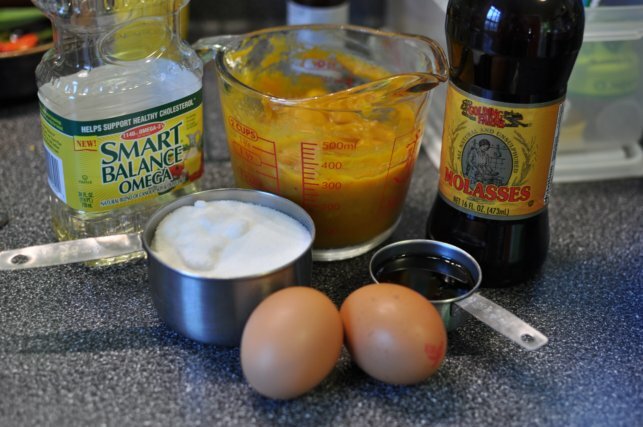 Combine 2 eggs, 1-1/2 cups mashed banana and pumpkin puree, 3/8 cups molasses, 1 cup sugar, 1/2 oil or melted butter. Stir just until moistened. Pour batter into prepared loaf pan. 3. Bake in a 350 degree oven for 60 minutes or until a toothpick inserted in the middle comes out clean. Cool in pan 10 minutes, then remove to cool on wire rack. 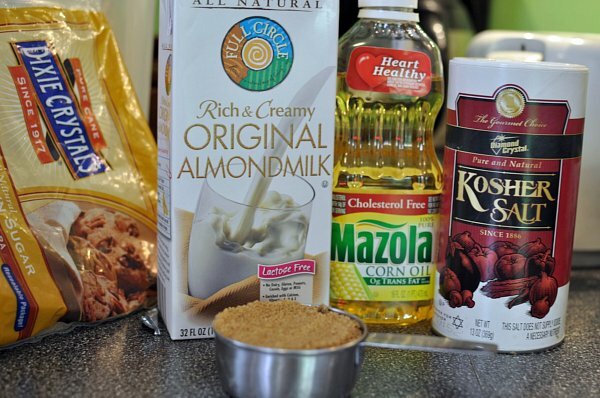 Optional streusel topping: Cut 3 tablespoons butter into 1/3 packed brown sugar. Sprinkle over batter before baking. One of the perks of being a teacher is the time off. 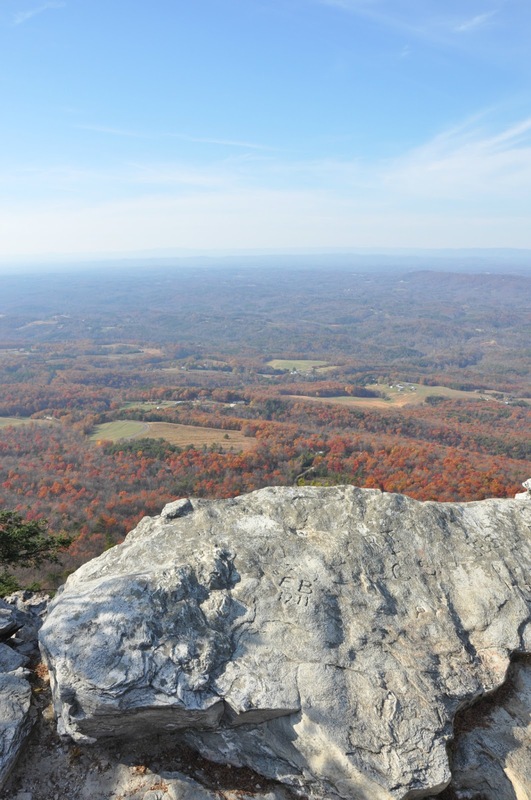 This past weekend was a three day weekend due to Veteran’s Day, so Eric and I took advantage of the extra time and headed to Hanging Rock State Park. 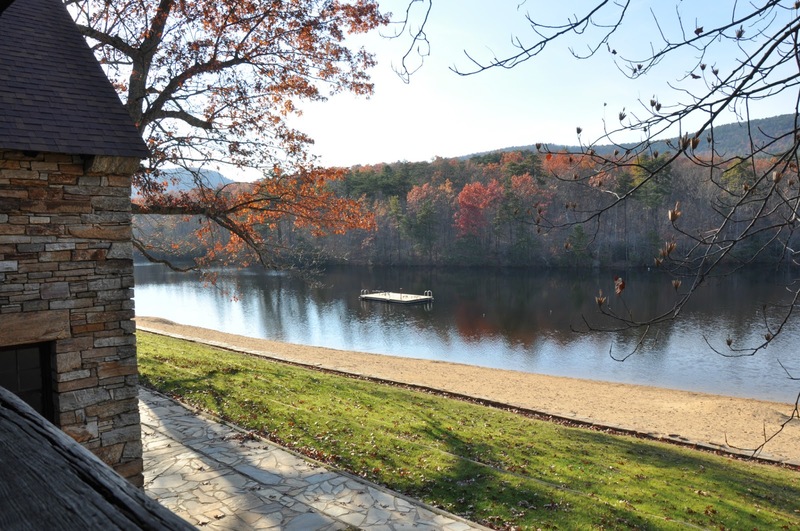 This is a lovely escape just over an hour’s drive away from Greensboro. 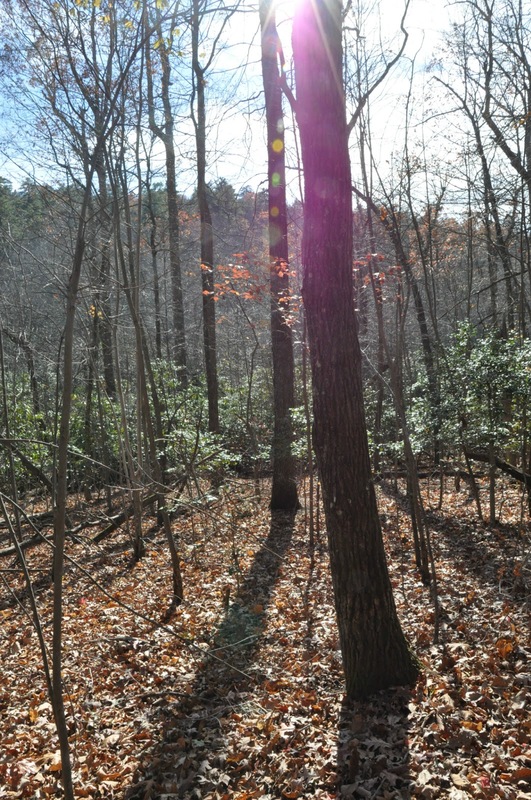 It was a perfect November day – tee shirt weather in Greensboro, which meant a little cooler in the foothills. 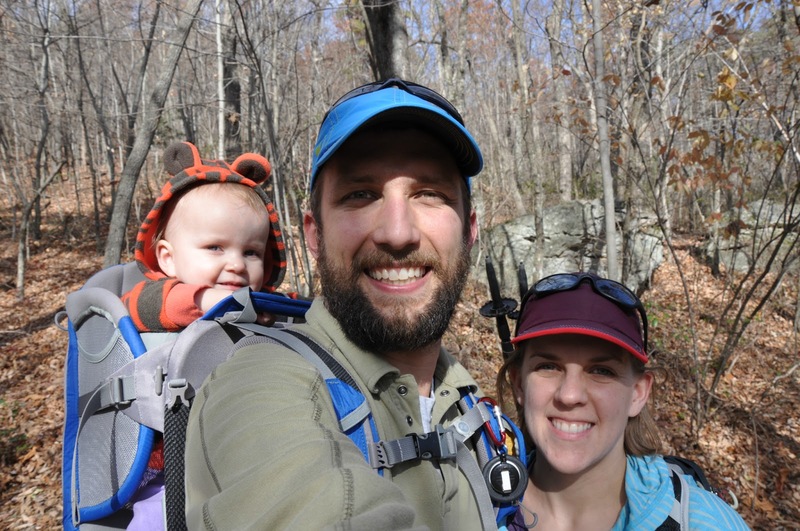 We decided to take the Moore’s Wall Loop Trail which is a 4.3 mile strenuous hike. 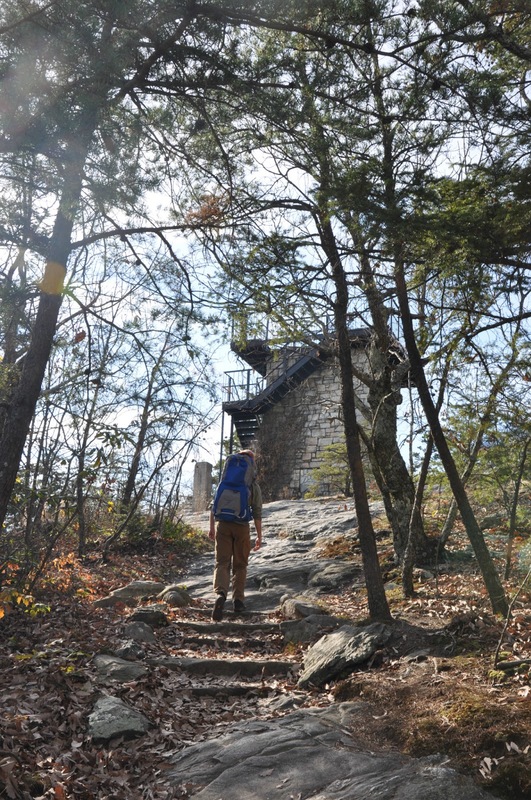 This hike starts off curving around Hanging Rock Lake, winds through the forest, and steadily climbs into the rocky mountain, and ending with a spectacular view from a fire lookout tower. Greta was a little tired from sleeping in the car, but in general a good sport. She always gets excited by the site of her hiking backpack, and this trip was no different. 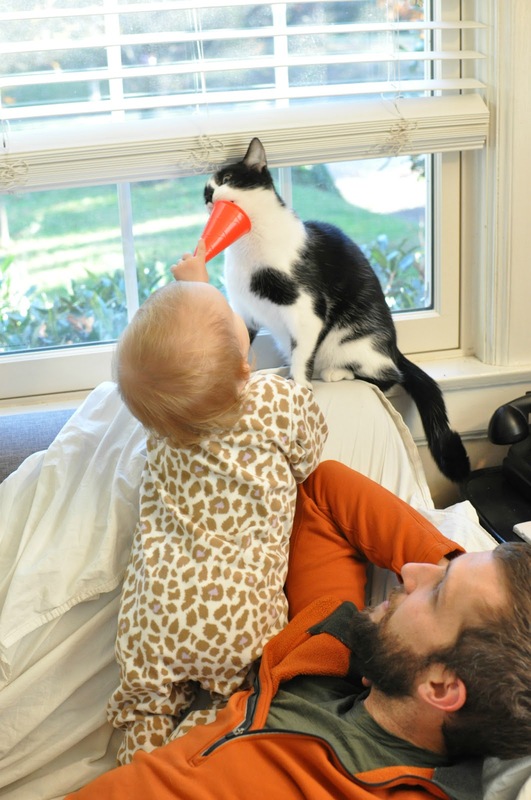 She’s a trooper as long as we keep her entertained with questions and leaves to grasp. 1. Don’t wait until they can walk. Start kids young. 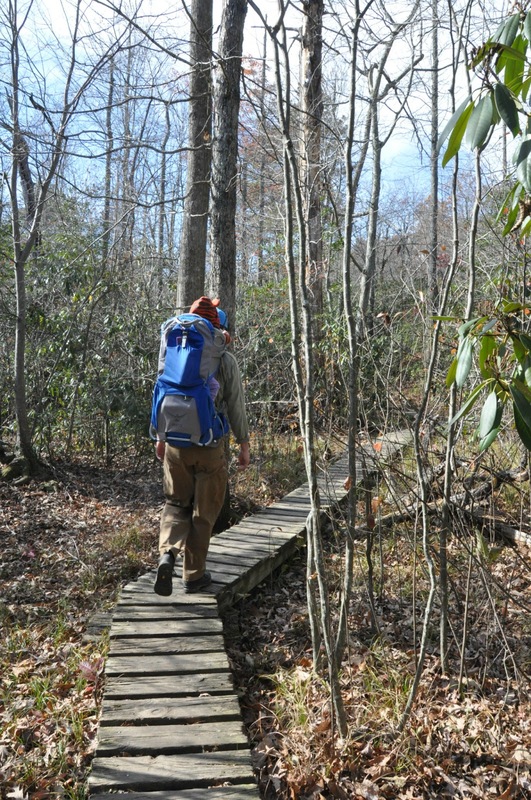 Kids need to get outdoors, especially out in nature, away from the city. 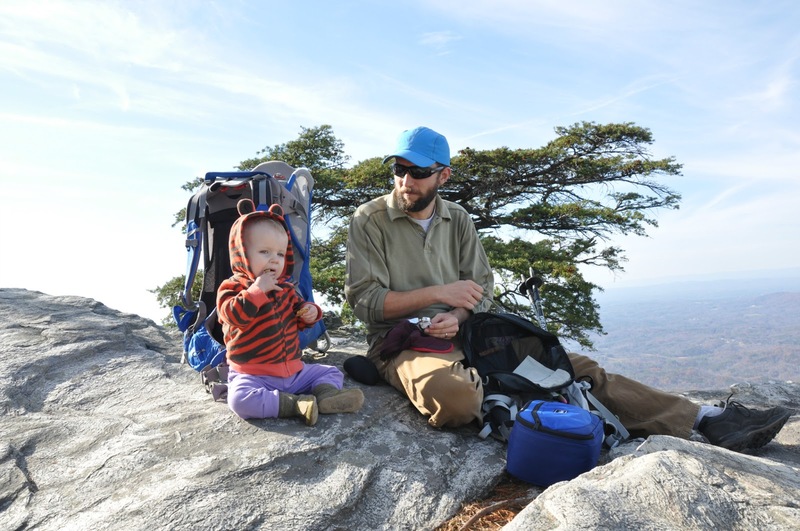 A backpack for carrying kids is the best way to start. Try on these backpacks before you buy, as you tend to get what you pay for. Buy secondhand, if you can. 2. Stay hydrated and prevent hunger fatigue. Pack twice as much water and healthy snacks as you think you will need. 3. Be prepared for the elements. Bring extra layers and rain gear. 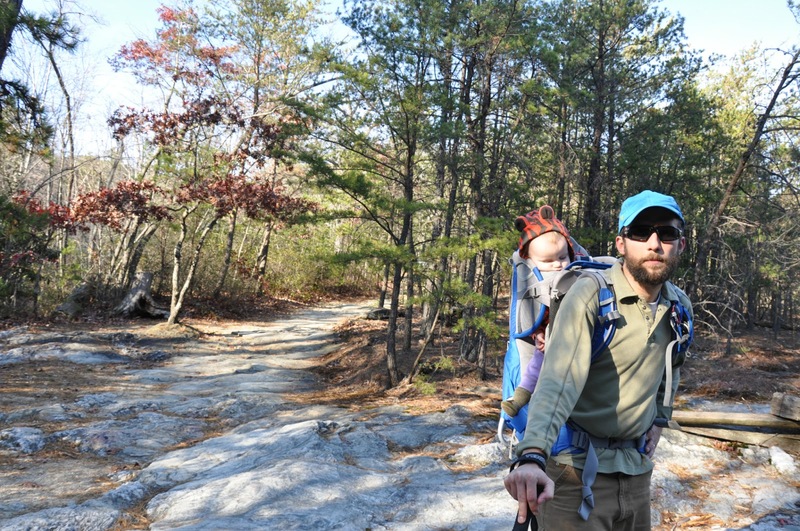 ALWAYS bring sunscreen on the trail and apply before getting out of the car. Wear hats and sunglasses as well. 4. Prevent injuries. Wear shoes that can withstand rigors of hiking. 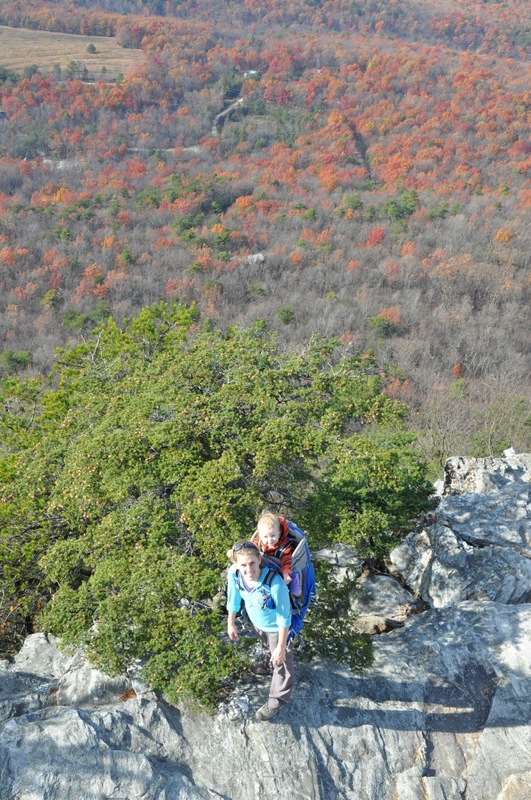 I cannot tell you how many kids I have seen complaining of sore feet and they are hiking in flip-flops! 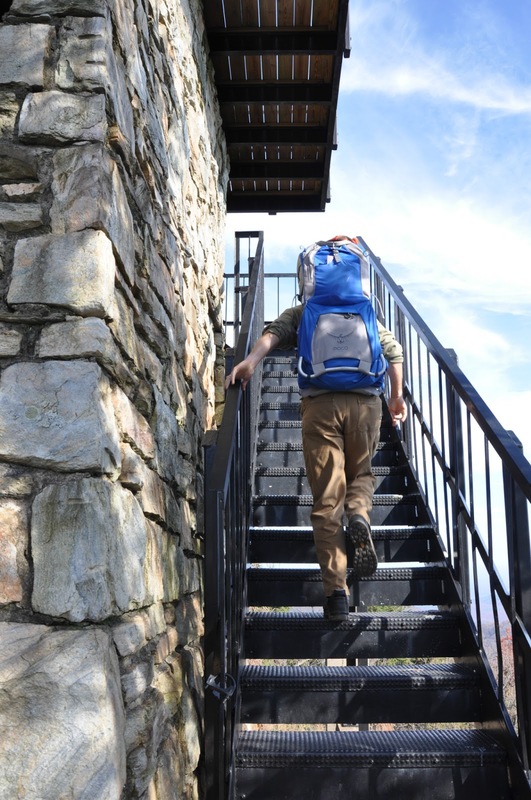 I was so grateful Eric was carrying Greta on this hike – I had forgotten how steep the end of this hike can be – this shows the last few stone steps before reaching the watch tower. The views are rewarding. 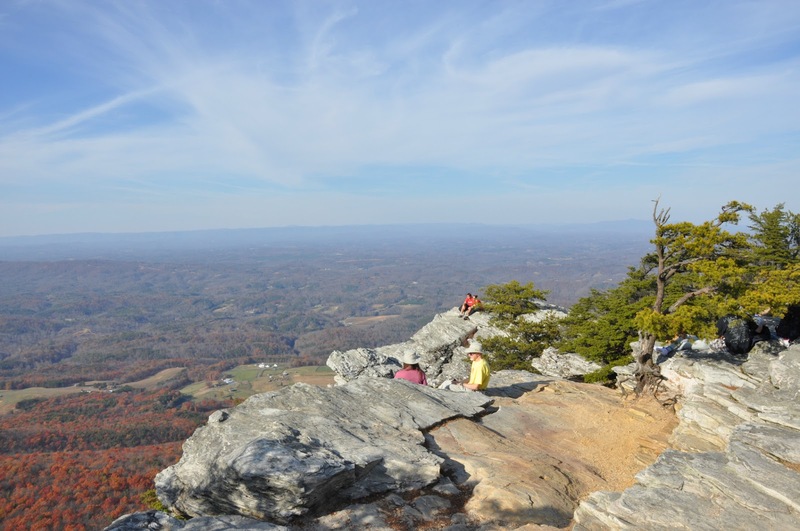 This shows Pilot Mountain which is currently burning due to a controlled burn that got out of hand. We could see some of the smoke, but could not smell the fire at all. 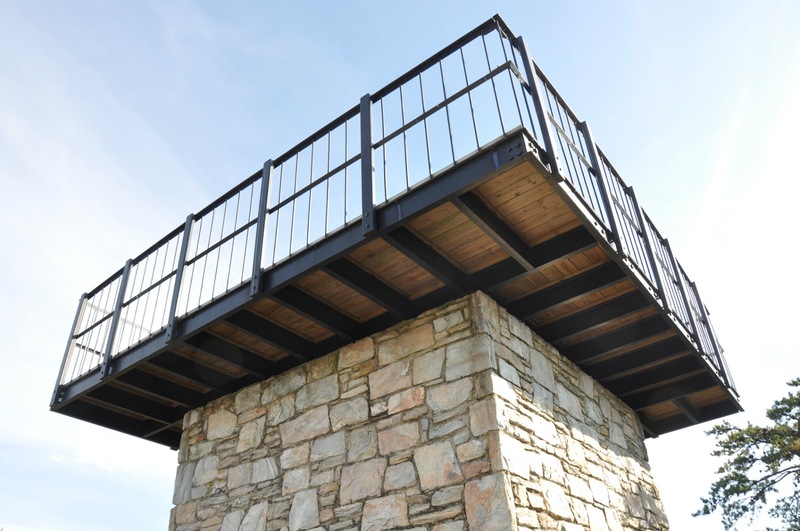 While we did not see all that many people on the trail, the watch tower was more crowded than usual – most likely due to the closure of nearby Pilot Mountain. Climbing the last sets of steps before the tower platform. 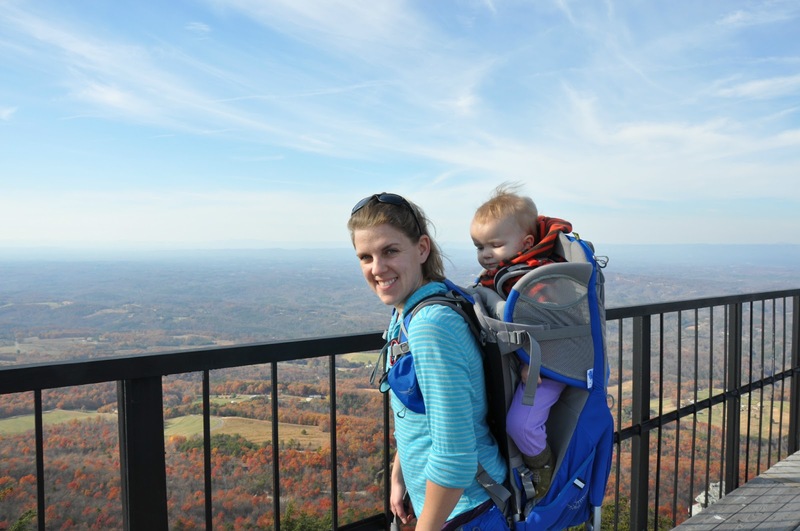 It was windy up here – Greta gasped for breath a couple times. The last time we were here, we brought Brownie, our dog with us. She is deathly afraid of heights and would not go near the railing. The leaves were still quite beautiful, even this late in November. Great the hungry goblin needed a snack before we headed back. 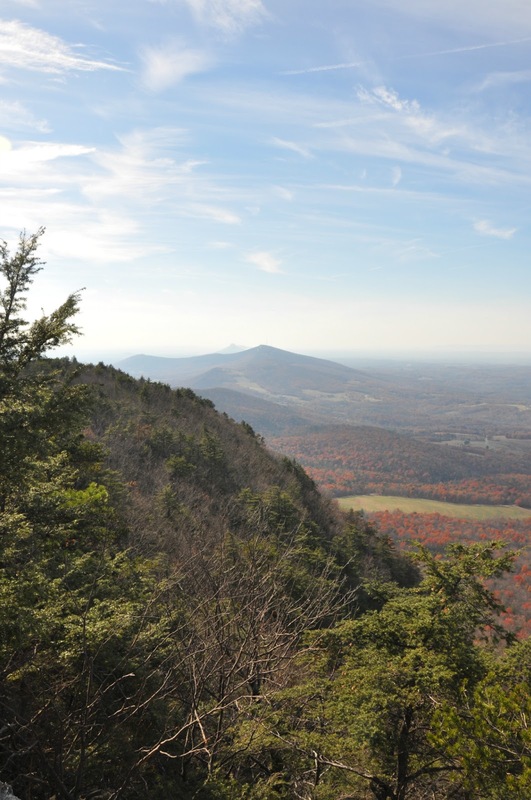 This hike is so rewarding with views – I was so happy with the weather on this day. This rock shows the graffiti of earlier hikers, circa 1900. We took the loop, and so took the shorter way down. This section is shorter in distance, but much harder on the knees – lots of worn smooth stone steps due to the higher traffic on this section. 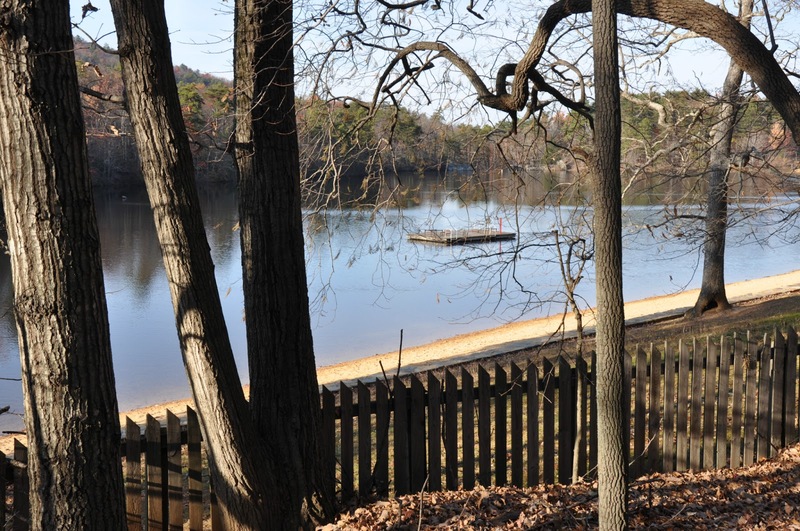 The lake looked a little cold today, but we vowed to make it up here sometime this summer and perhaps stay in one of the cabins. 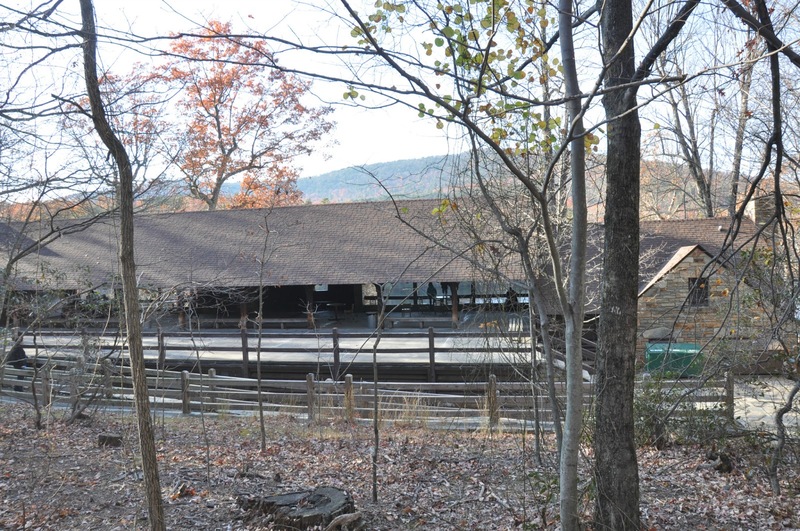 The bathhouse was built from 1935 to 1942 by the Civilian Conservation Corps (CCC). 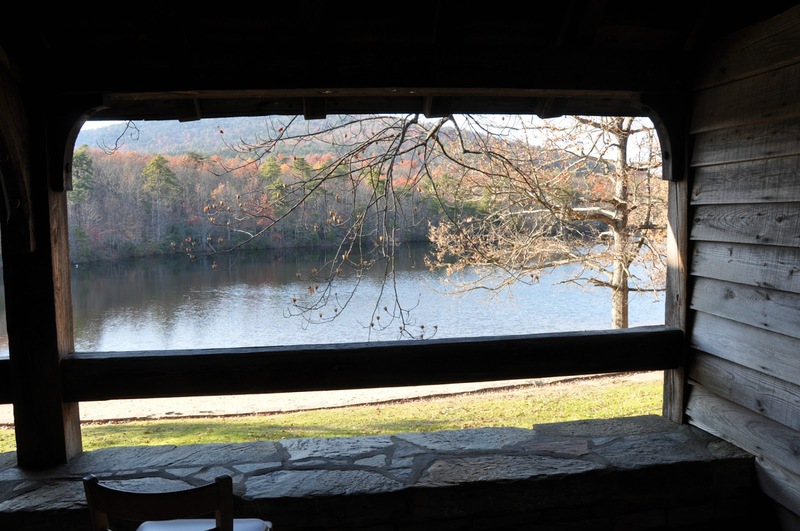 It offers lovely views of the lake, has modern bathrooms, and a comfortable place to sit and relax. 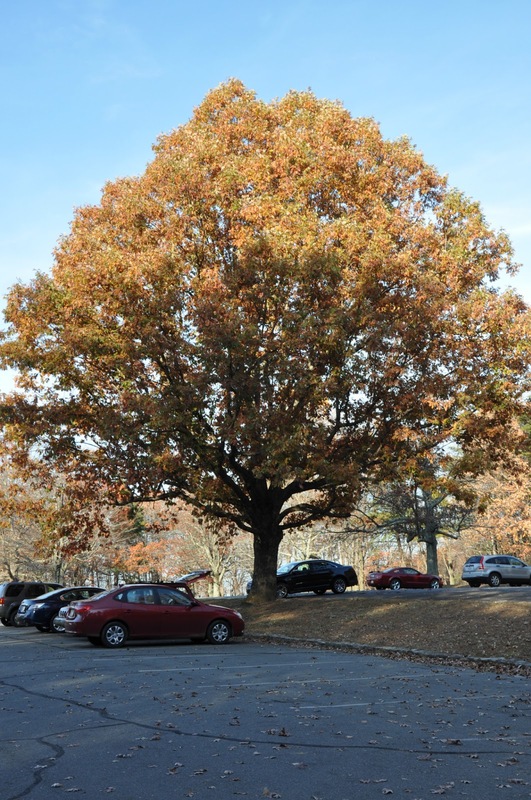 I always say this is one of the most beautiful park parking lots I’ve been to – full of mature trees, granite stone walls, and lake and Sauratown Mountain views. I admit, I tend to over do it every year with pumpkin: pumpkin chai tea, pumpkin waffles, pumpkin muffins, pumpkin pancakes, pumpkin funnel cake, pumpkin coffee, pumpkin ice cream, pumpkin brownies, pumpkin chocolate, chocolate pumpkin pie, pumpkin pizza, pumpkin pasta, and of course pumpkin butter. 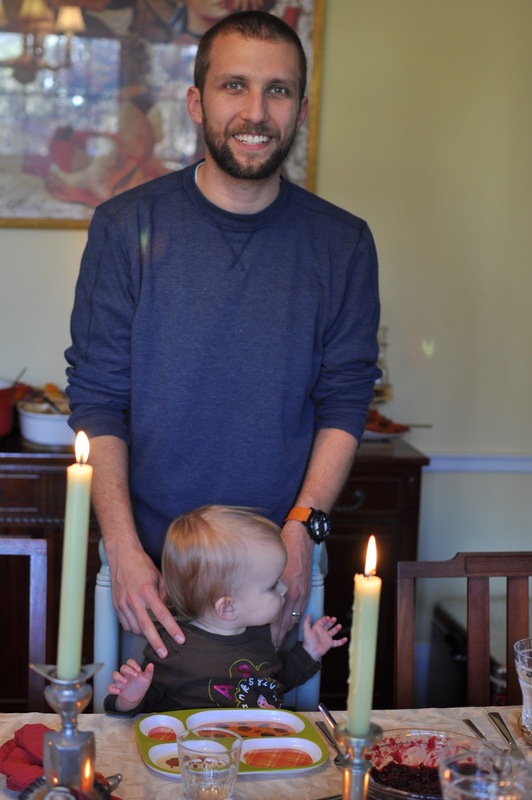 Last week my a dreadful thing happened – my pumpkin butter ran out. GONE! This may have been a delight to Eric who suffers through my pumpkin craze annually, but I was craving more. It was at this time that I also realized I had never gotten around to carving pumpkins for Halloween. Therein lies the answer to my conundrum. So for the first time I can remember, I did not carve a pumpkin, but made pumpkin butter. 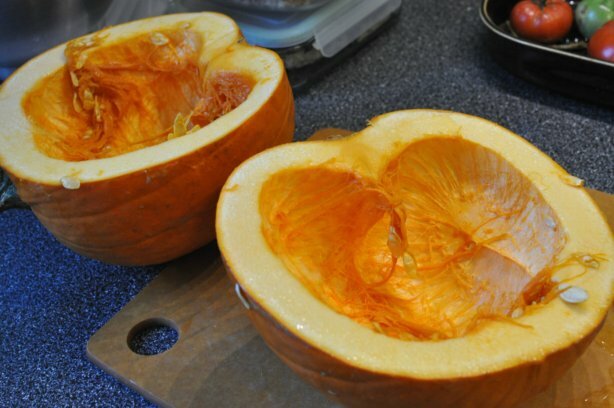 Cut 1 pumpkin in half and remove the seeds. Ideally a sweet pie pumpkin would be used, however I had a smallish carving pumpkin and decided to try this anyway. 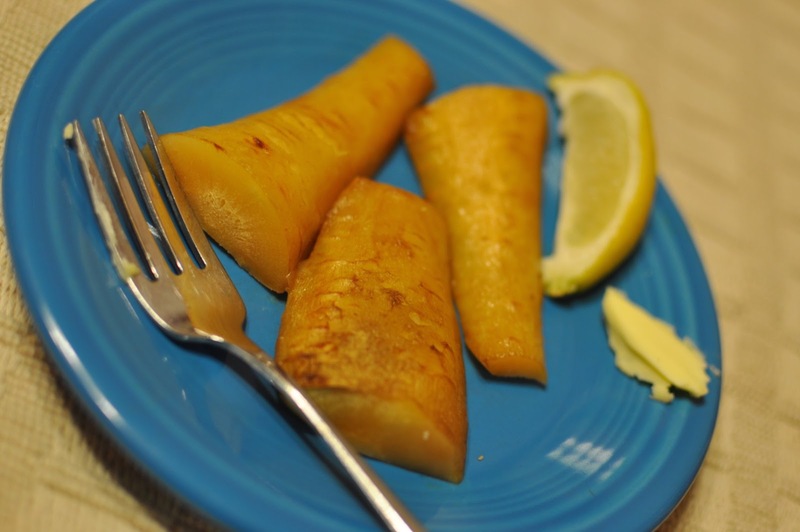 Cut pumpkin into wedges and place on a rimmed baking sheet. This is my entire pumpkin on one sheet, which should give you an idea on the size of the pumpkin. Roast at 375 for 35 to 40 minutes. 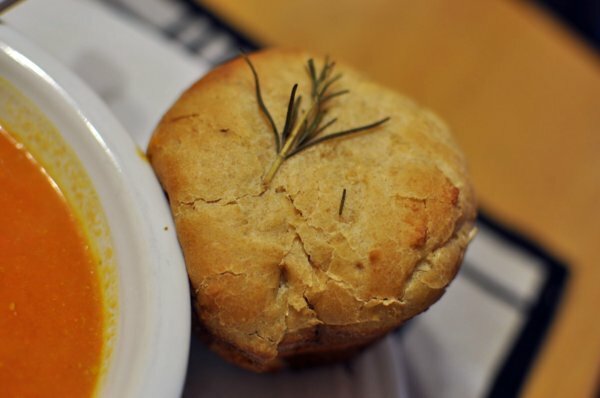 Test with a fork – pumpkin flesh should be very soft. 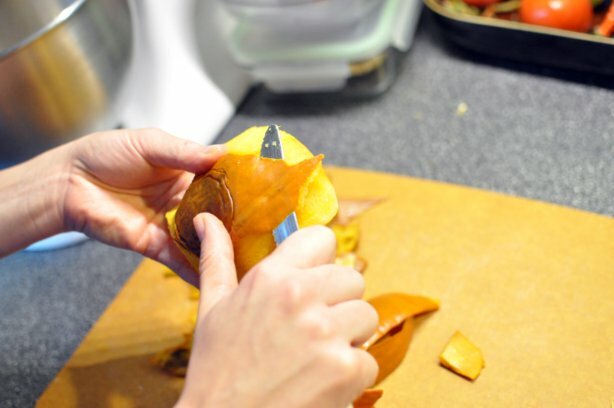 Once the pumpkin is cool enough to handle, peel off the pumpkin rind. I allowed my pumpkin to cool overnight. This is an easy recipe to break into segments if you do not have the time to make this straight through. 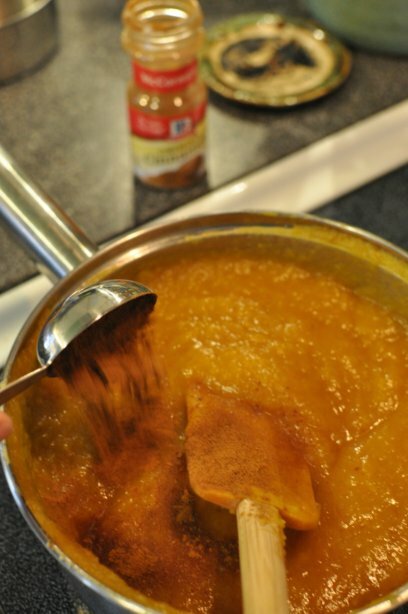 Add 1 cup of water to pumpkin mixture during the blending process; blend pumpkin until smooth. I ended up with 4-1/2 cups of pumpkin puree from my one pumpkin. 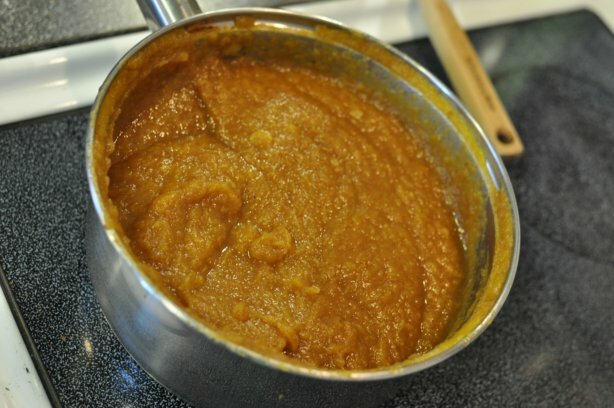 Place pumpkin puree into a large saucepan. 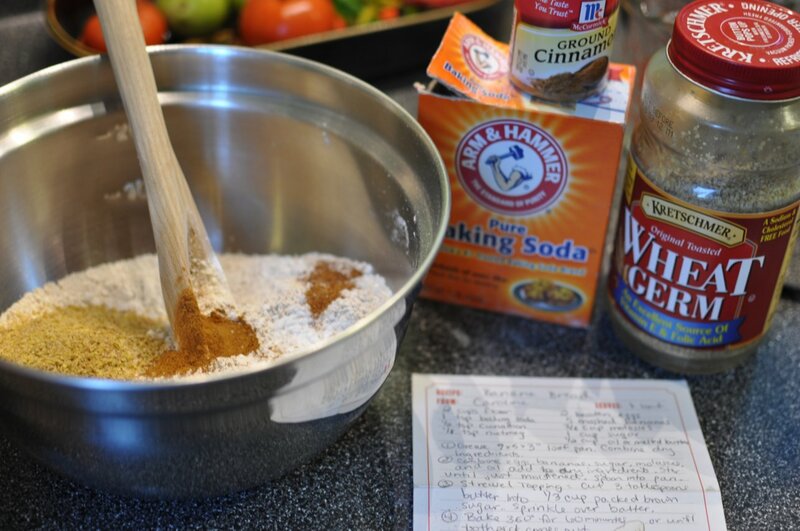 1 tablespoon cinnamon, 1 teaspoon nutmeg, and stir. Bring pumpkin mixture to a boil, reduce to low heat and cover, propping one side of the lid open. 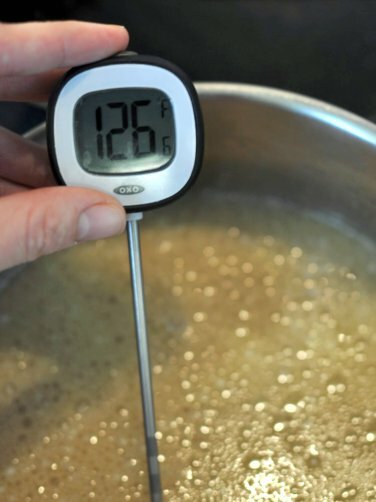 Cook on low heat for 30 minutes or until thickened. 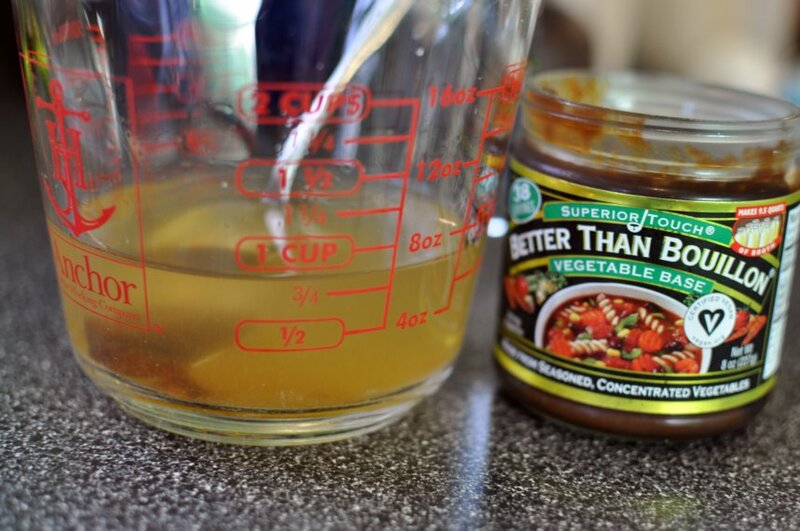 I boiled my jars to clean them, however I did not do the official preserving canning method for this recipe. 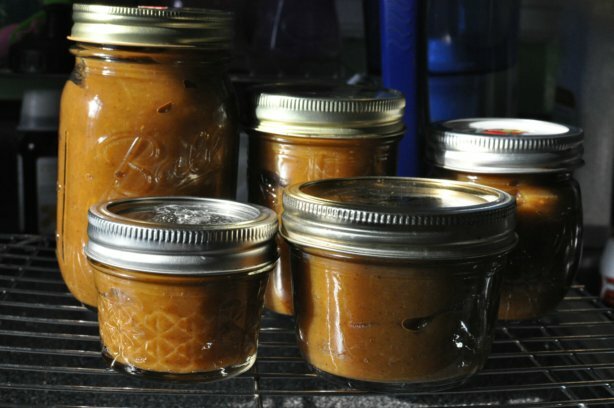 That means the jars of pumpkin butter must be refrigerated and eaten within two weeks. 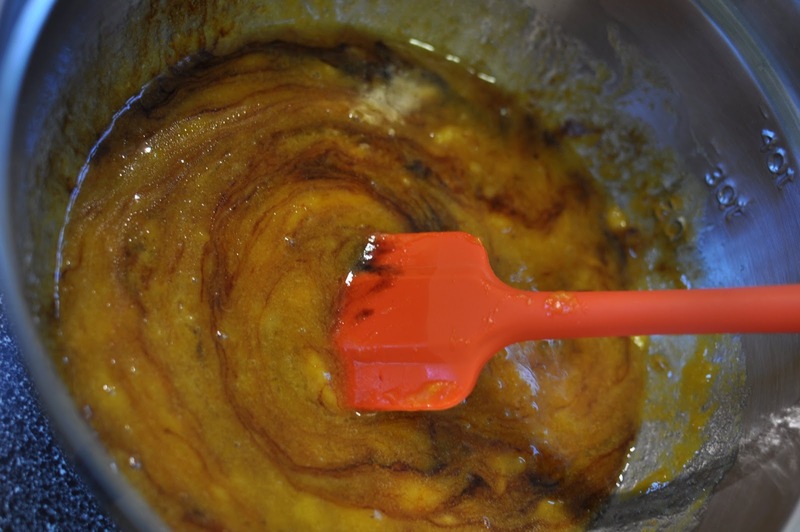 This bubble illustrates what happens when the pumpkin butter mixture boils – hot splatters! Use caution, as it is easy to burn oneself. I used my 30 minutes of cooking and thickening to play with Greta who was having a blast tormenting cats with her toys. 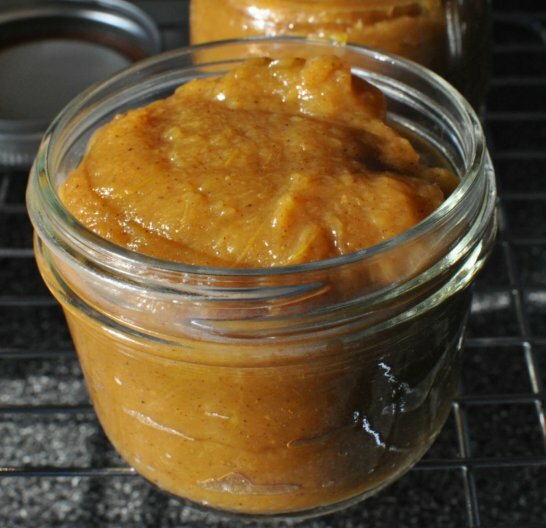 When mixture is thickened, ladle pumpkin butter into jars. Cover and allow to cool. Refrigerate and use within 2 weeks. I got these 5 jars out of one pumpkin! 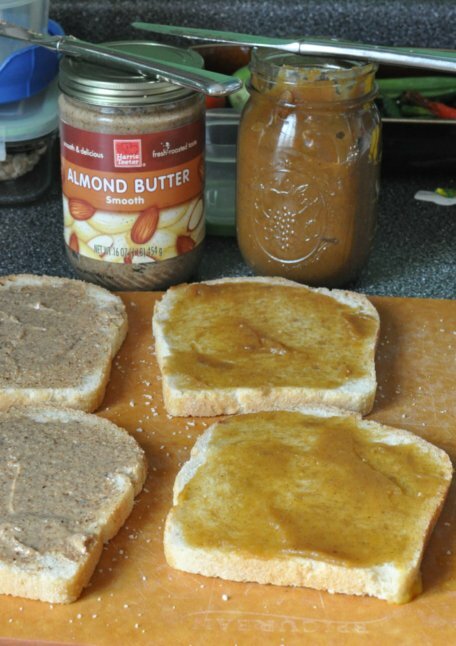 One really good pumpkin butter suggestion: almond butter and pumpkin butter sandwiches. This is what we will be taking for lunches this week. 1. 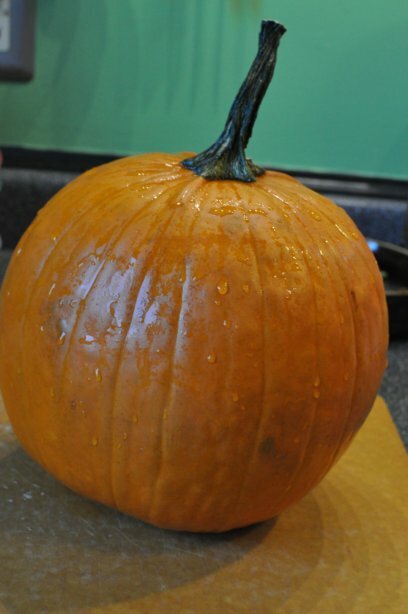 Cut 1 pumpkin in half and remove the seeds. 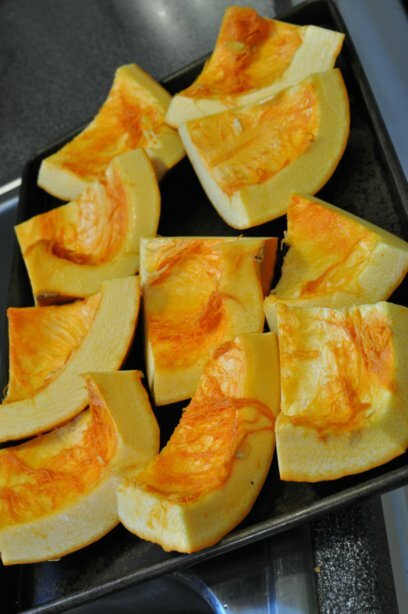 Cut pumpkin into wedges and place on a rimmed baking sheet. This is my entire pumpkin on one sheet, which should give you an idea on the size of the pumpkin. Roast at 375 for 35 to 40 minutes. Test with a fork – pumpkin flesh should be very soft. 2. 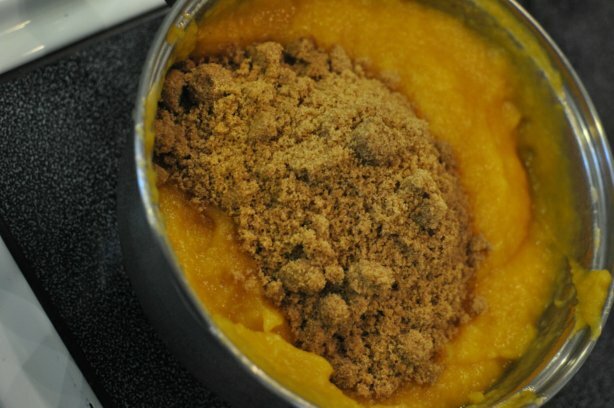 Once the pumpkin is cool enough to handle, peel off the pumpkin rind and place in a blender. 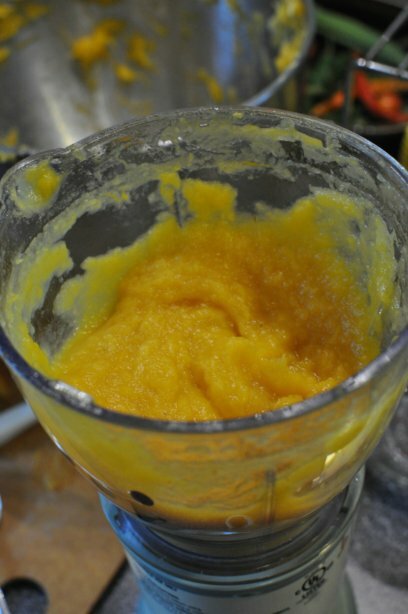 Add 1 cup of water to pumpkin mixture during the blending process; blend pumpkin until smooth. 3. Place pumpkin puree (4-1/2 cups) into a large saucepan. 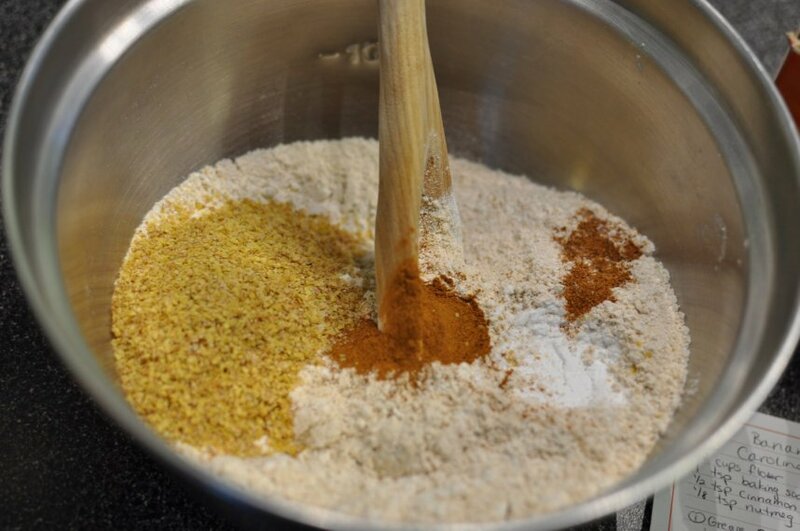 Add 1-1/4 cup brown sugar, 1 tablespoon cinnamon, 1 teaspoon nutmeg, and stir. Bring pumpkin mixture to a boil, reduce to low heat and cover, propping one side of the lid open. Cook on low heat for 30 minutes or until thickened. 4. 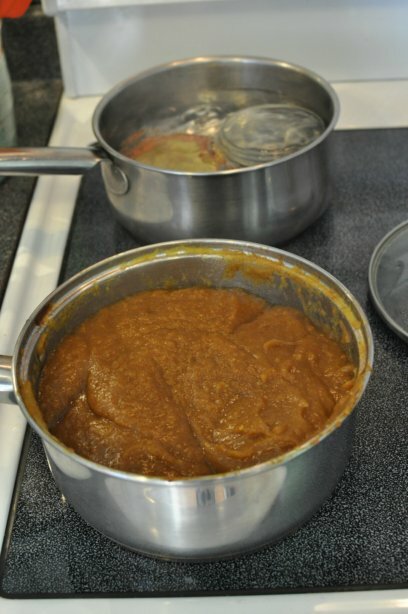 When mixture is thickened, ladle pumpkin butter into jars. Cover and allow to cool. Refrigerate and use within 2 weeks.